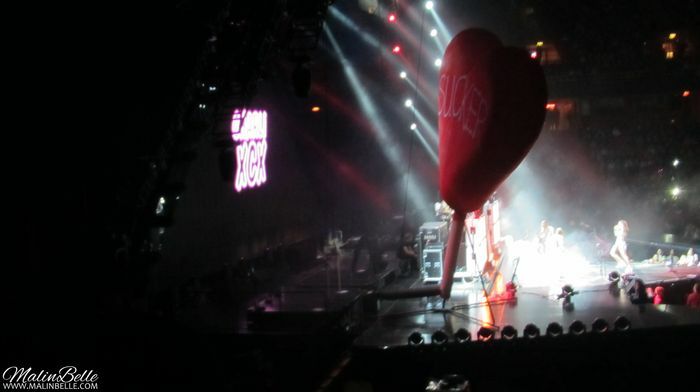 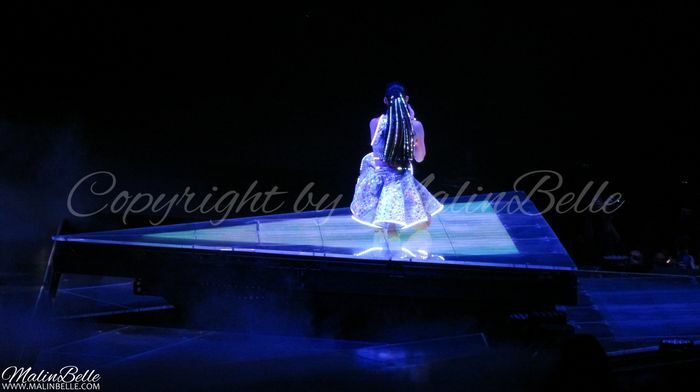 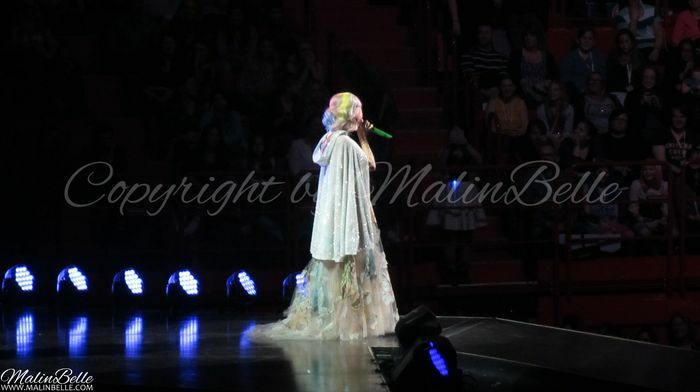 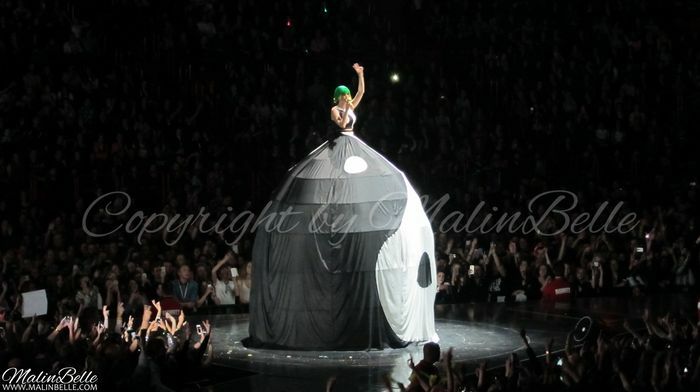 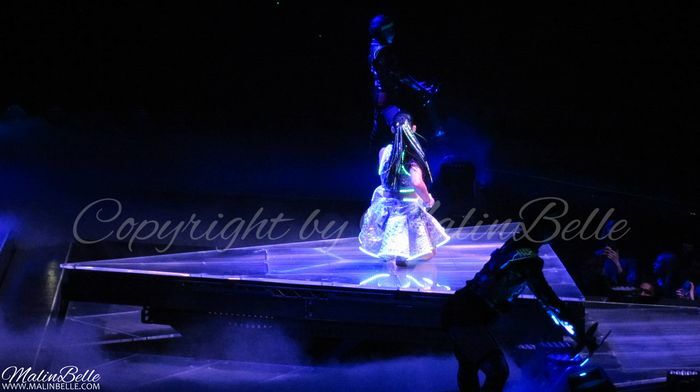 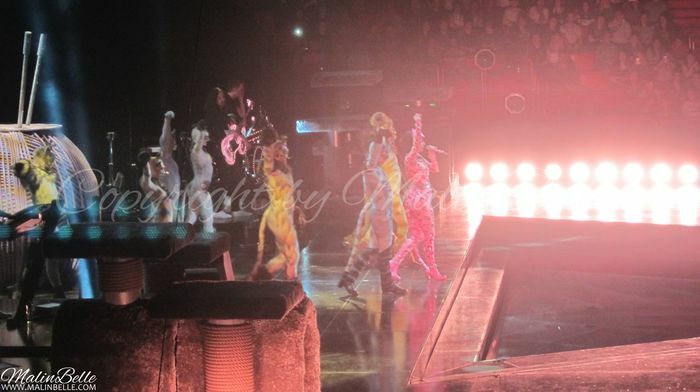 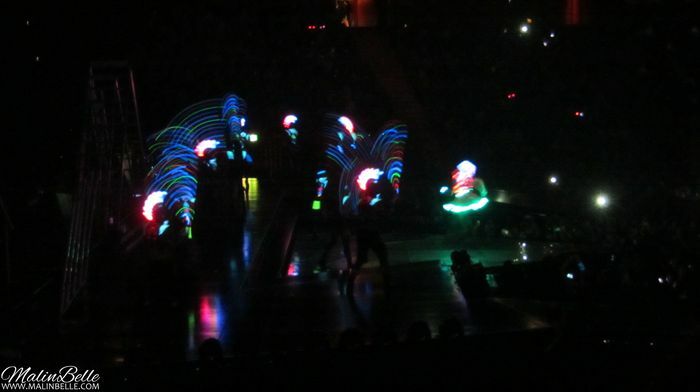 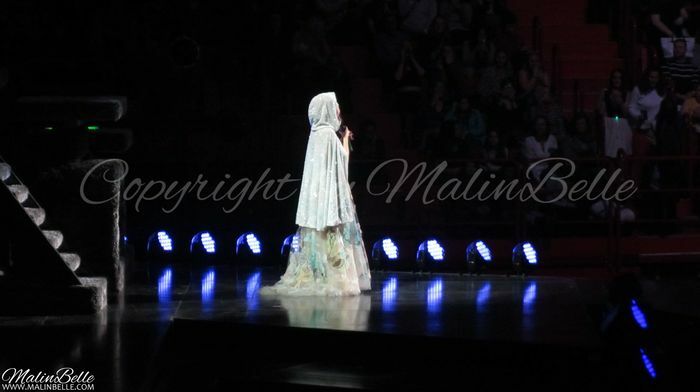 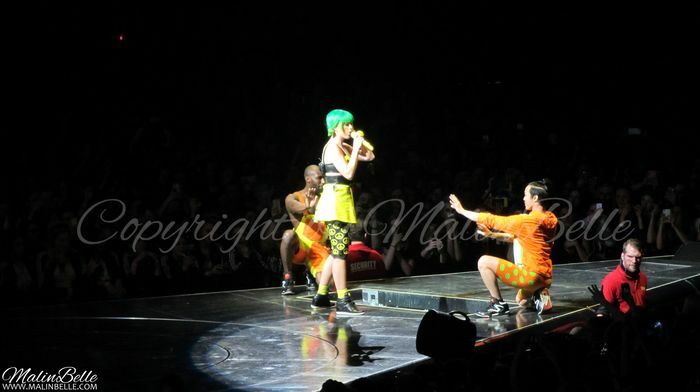 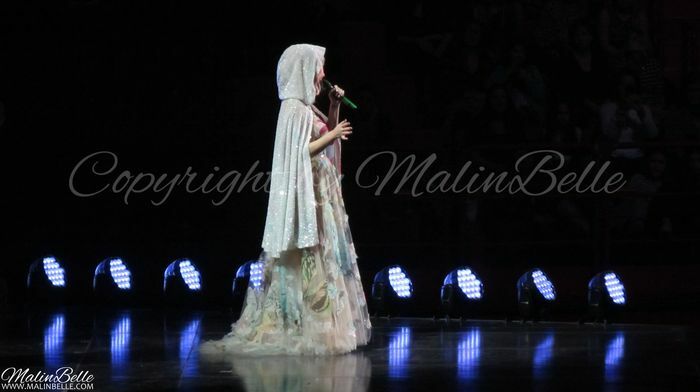 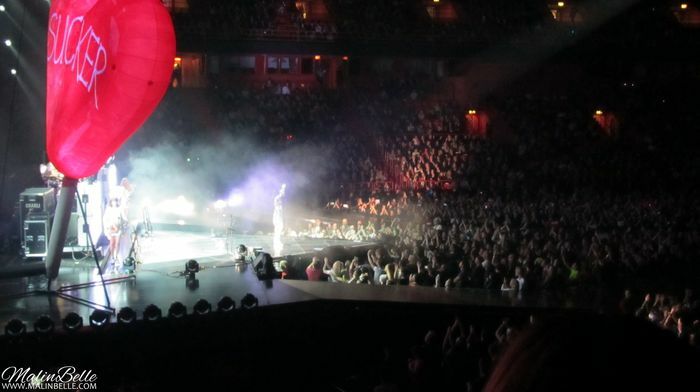 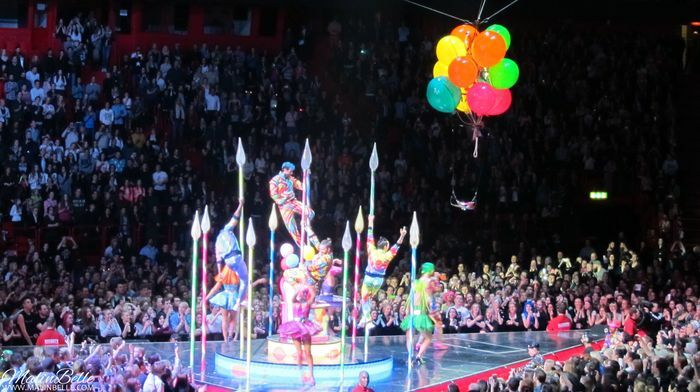 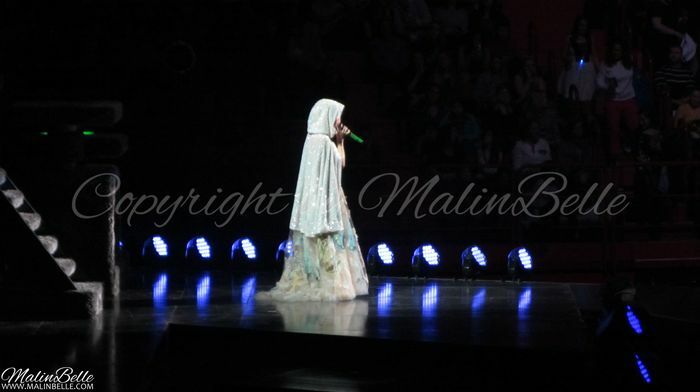 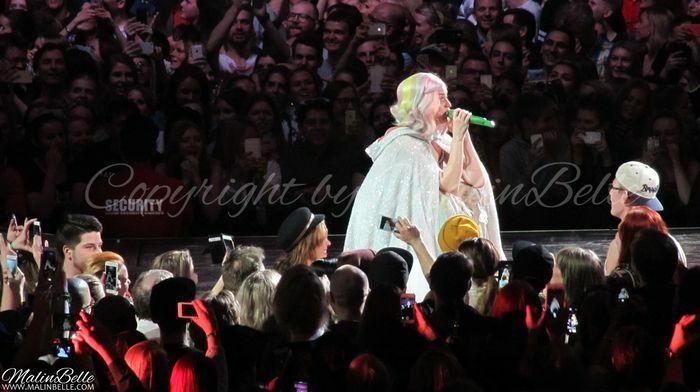 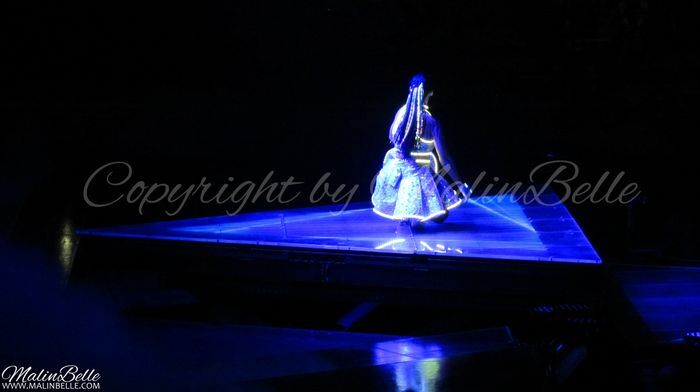 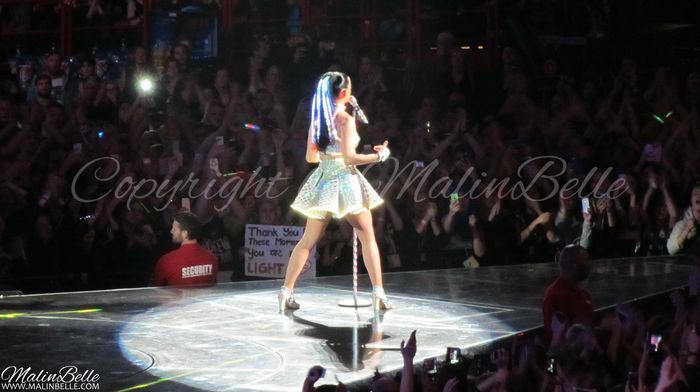 Katy Perry @ Ericsson Globe, Stockholm, Sweden. 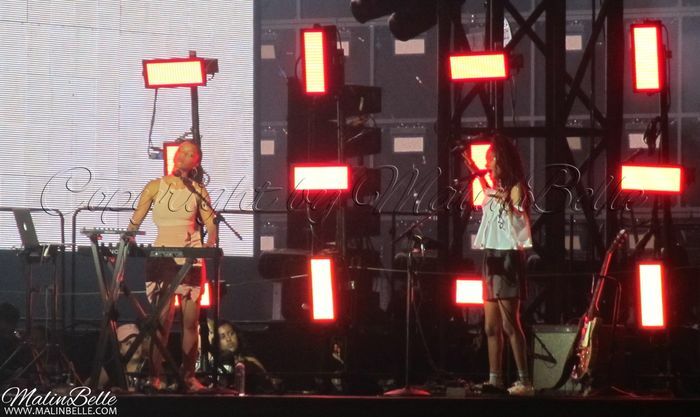 Charli XCX was the opening act for Katy Perry and she was awesome! 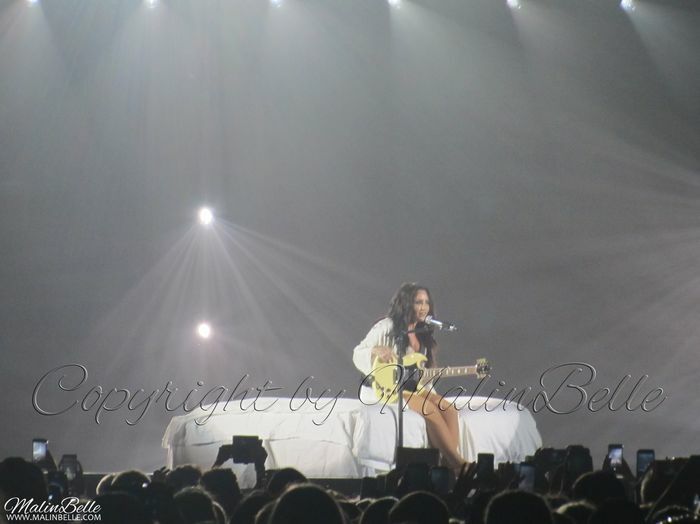 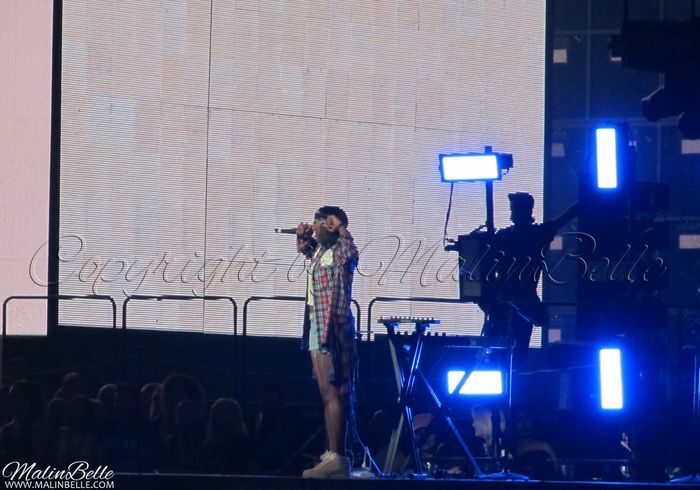 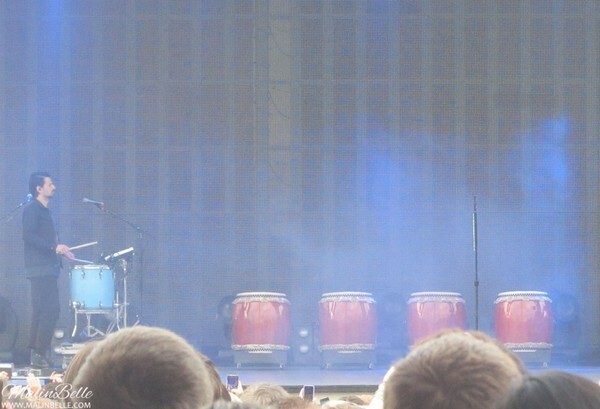 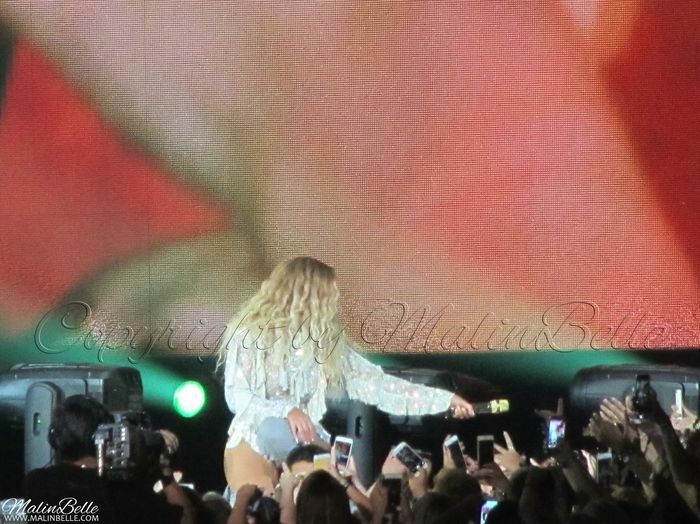 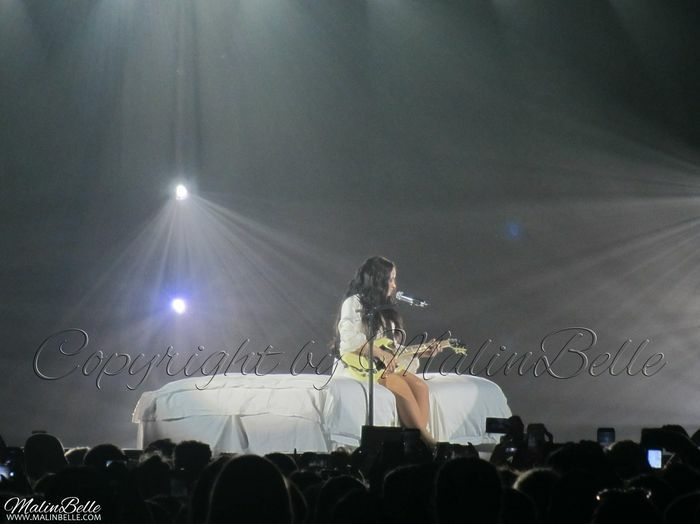 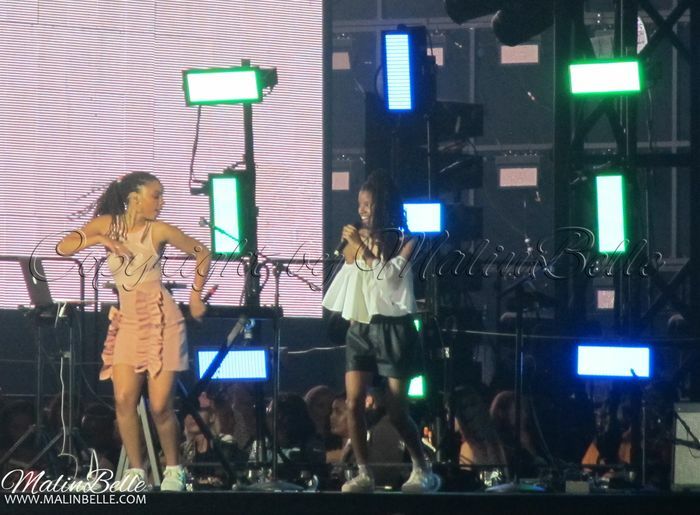 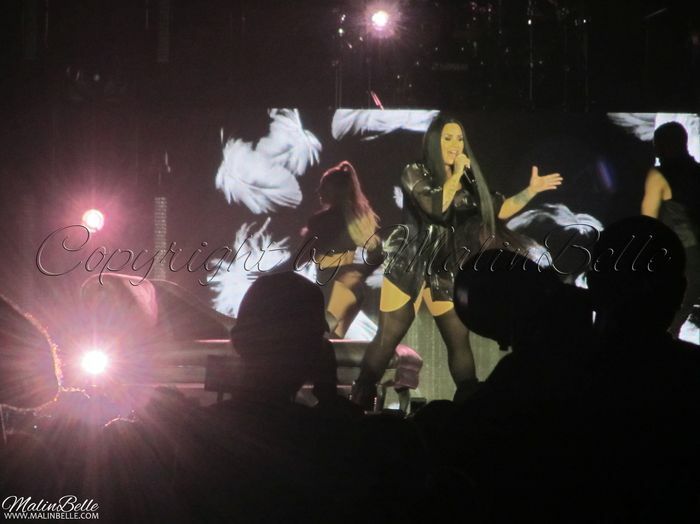 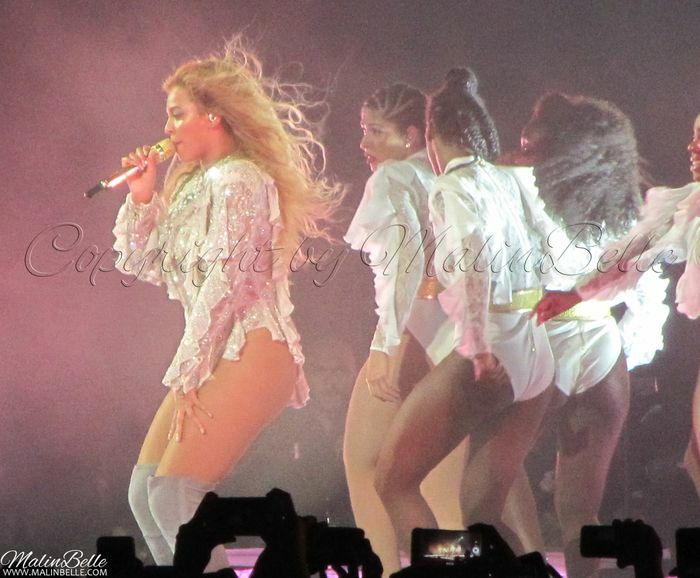 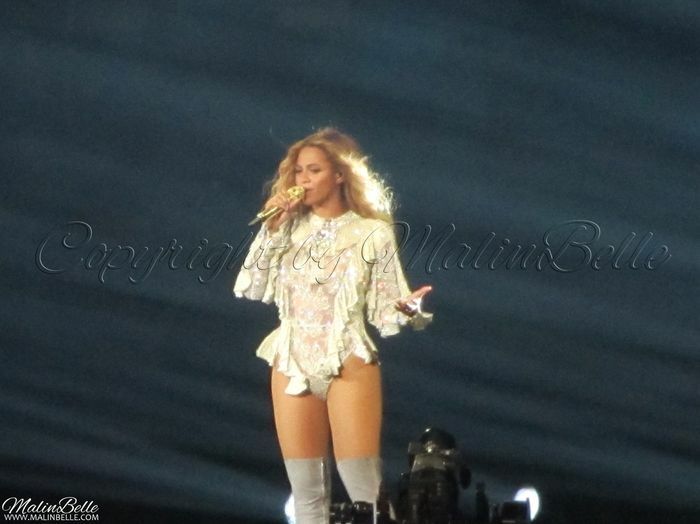 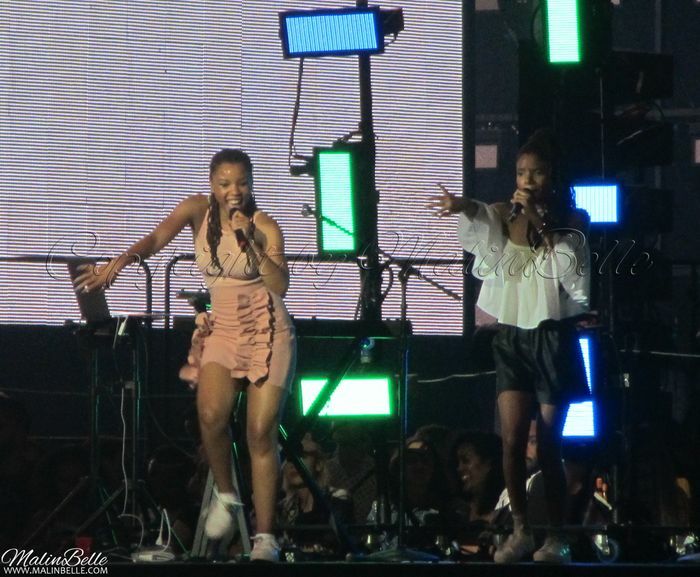 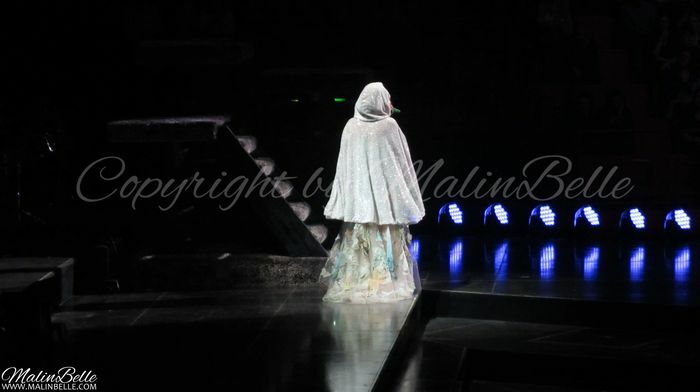 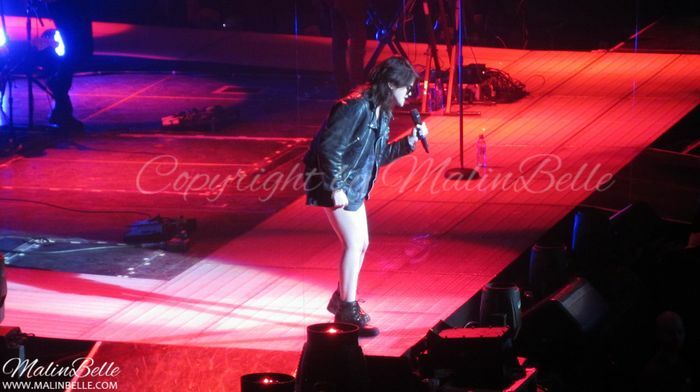 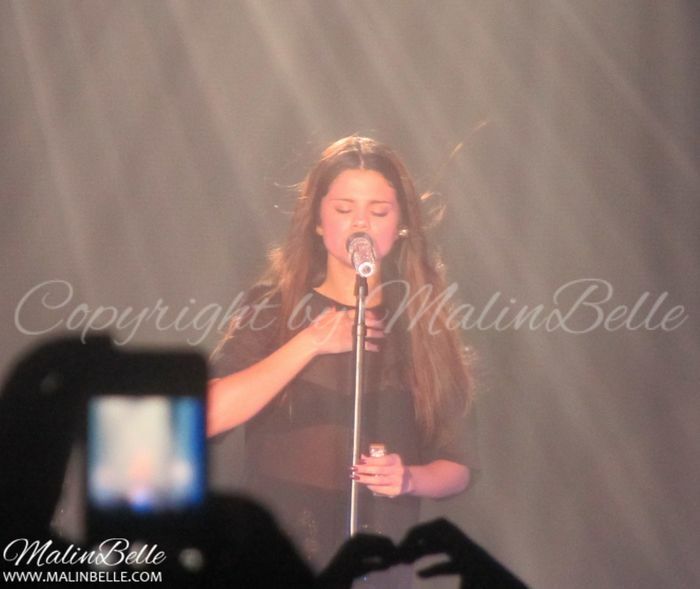 ♥ I obviously like her music as well and I'm happy that I got to see her LIVE because she was SO good! 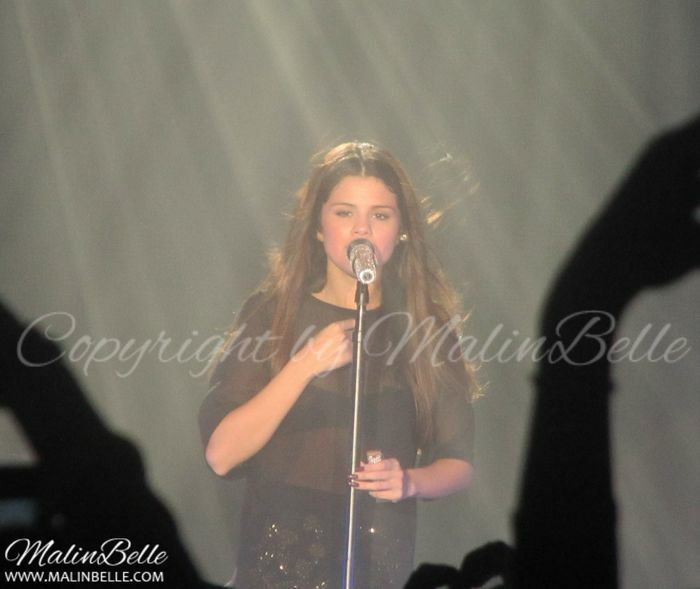 She's really talented and I hope that I get to see her LIVE some other time, that's how good she was! 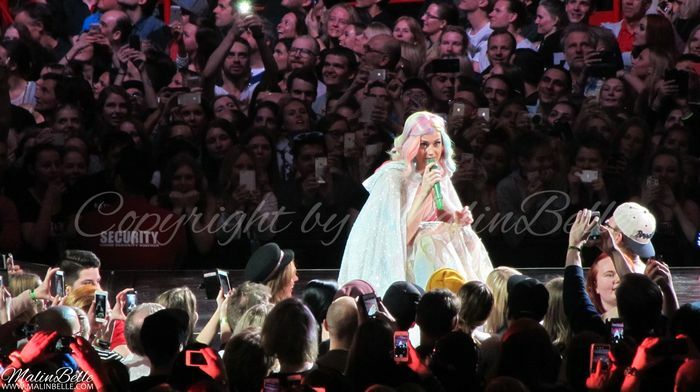 Roar | Part of Me | Wide Awake | This Moment / Love Me | Dark Horse | E.T. 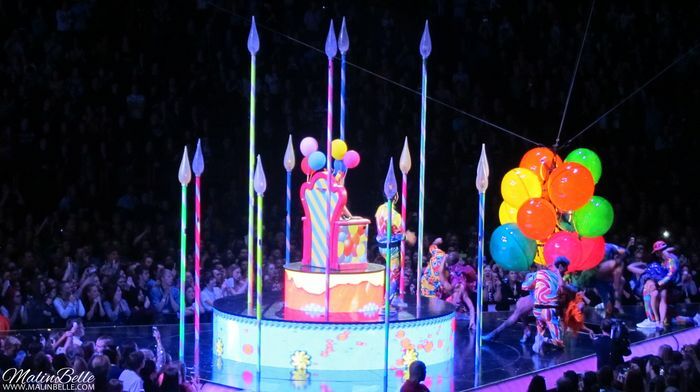 | Legendary Lovers | I Kissed A Girl | Hot N Cold | International Smile / Vogue (Madonna cover) | By the Grace of God | The One That Got Away | Unconditionally | Walking On Air | It Takes Two | This Is How We Do / Last Firday Night (T.G.I.F.) 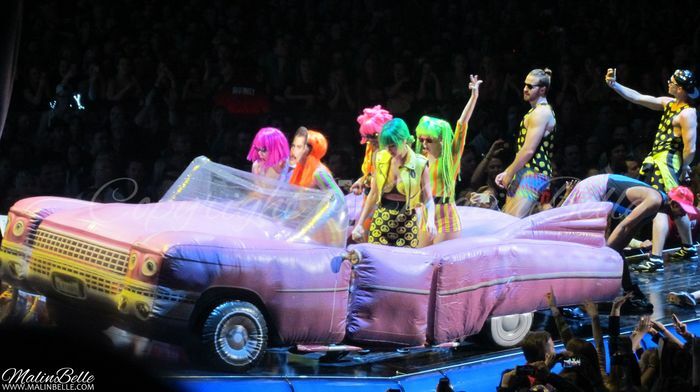 | Teeange Dream | California Gurls. 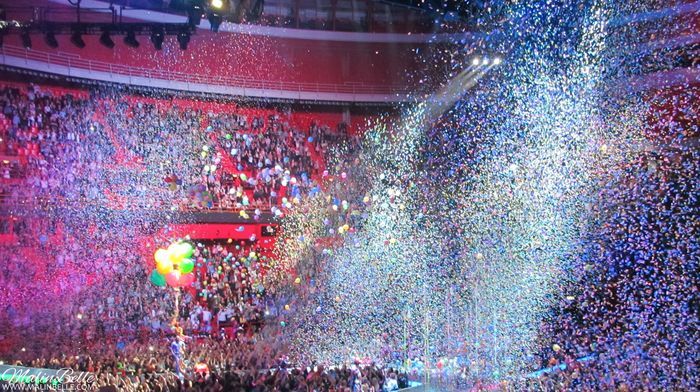 Charli XCX @ Ericsson Globe, Stockholm, Sweden. 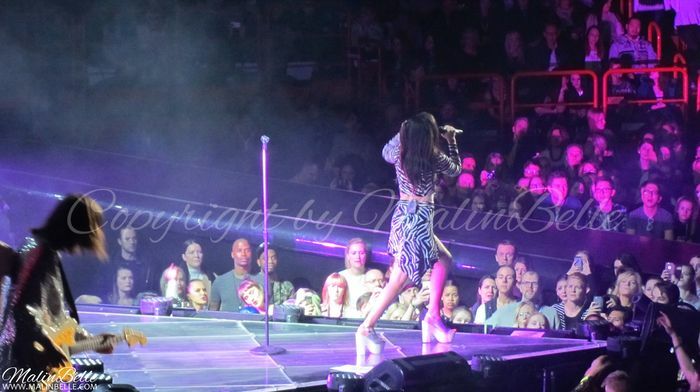 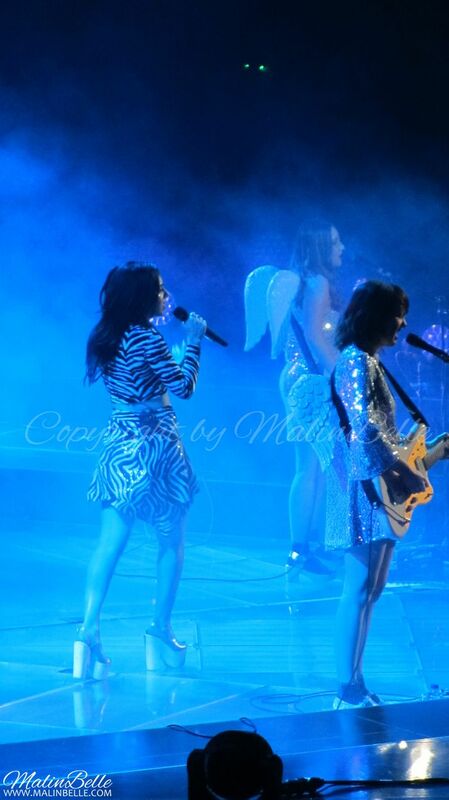 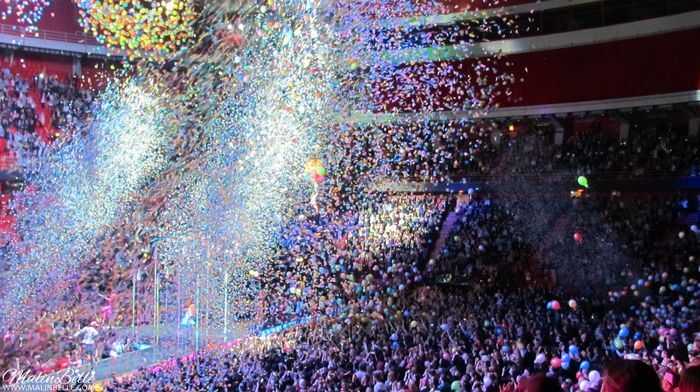 Charli XCX opened for Katy Perry on her “The Prismatic World Tour” concert at Ericsson Globe in Stockholm, Sweden. 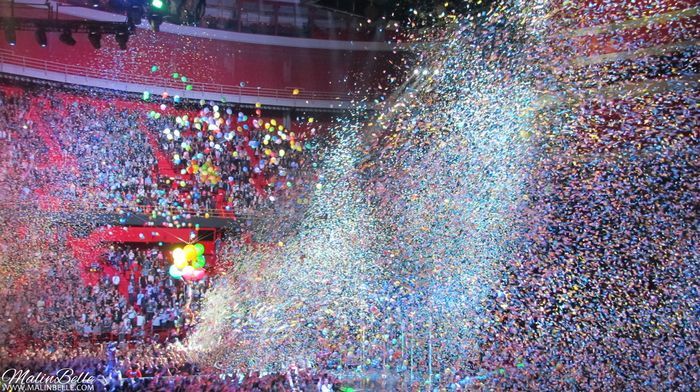 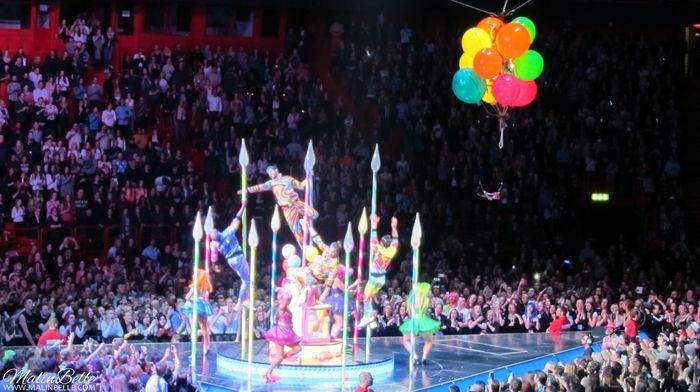 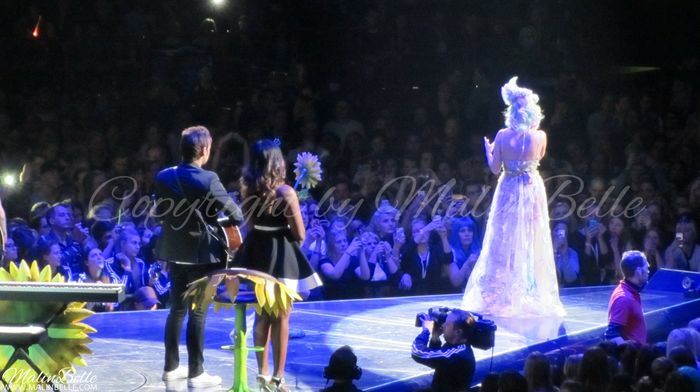 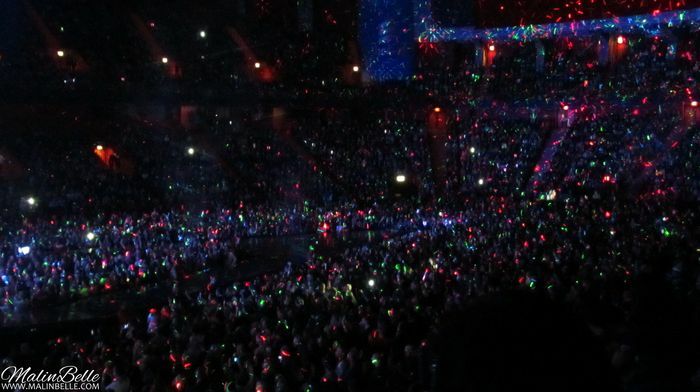 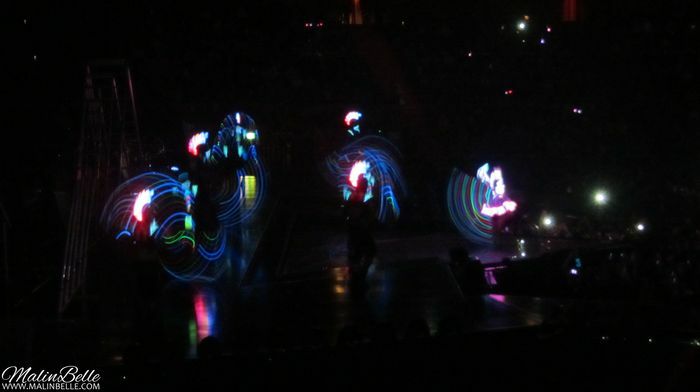 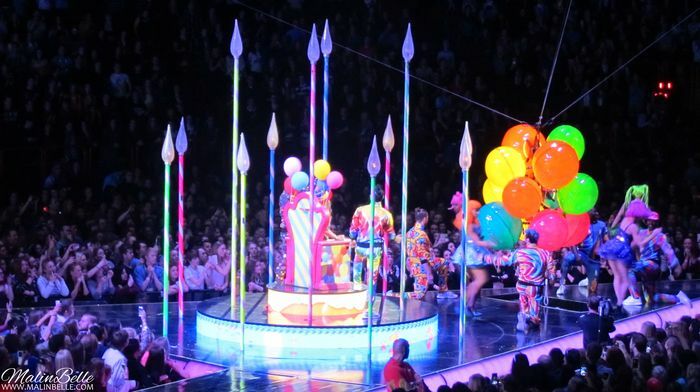 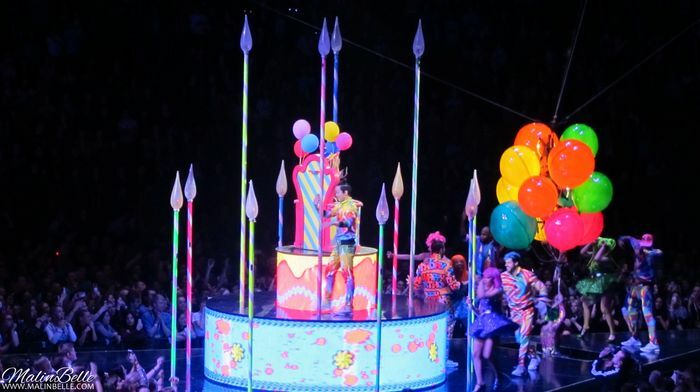 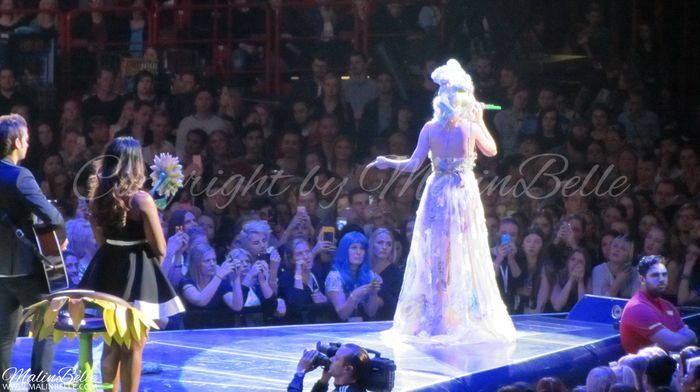 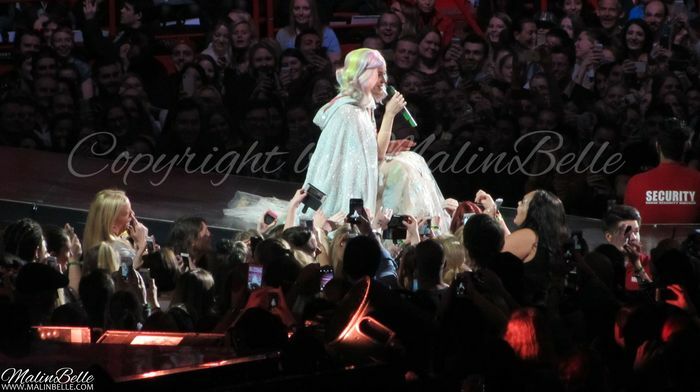 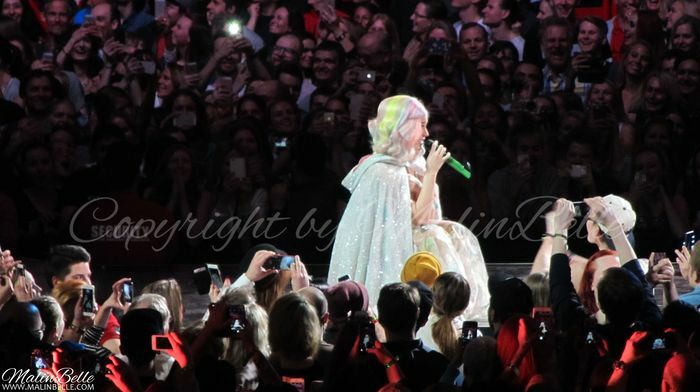 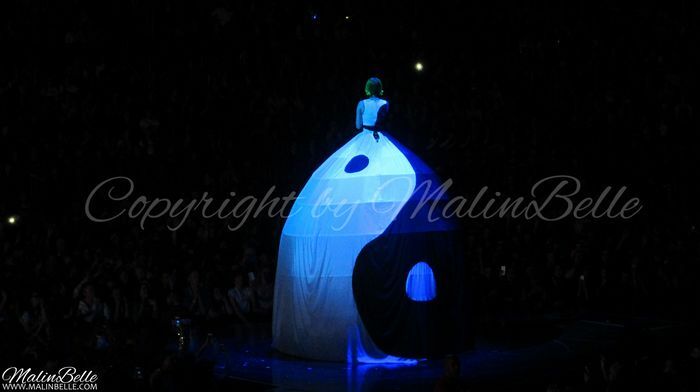 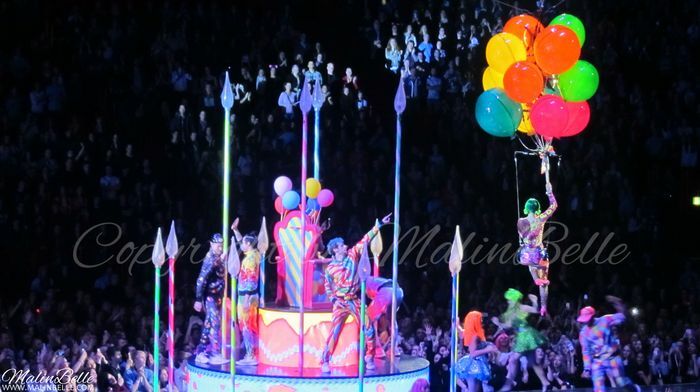 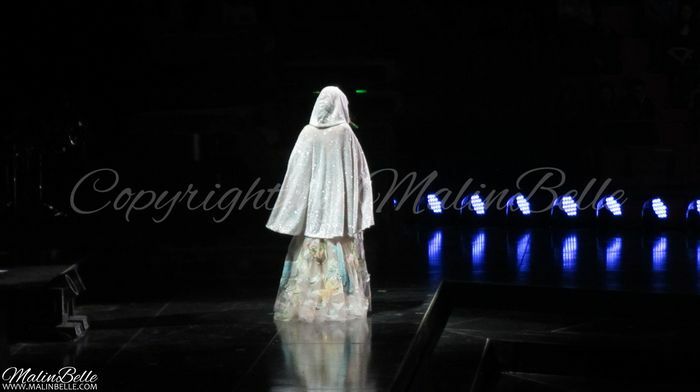 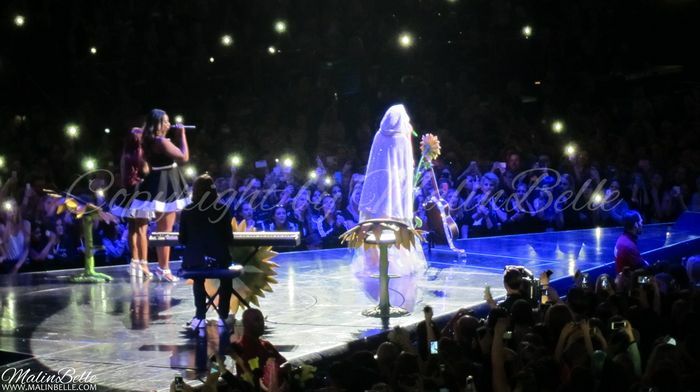 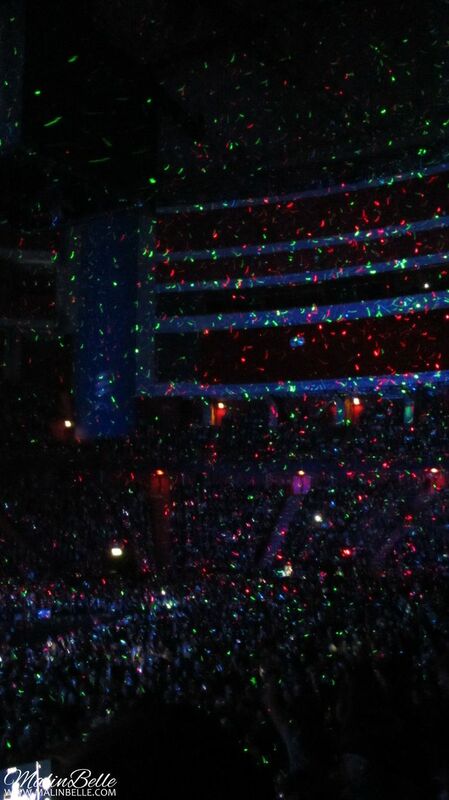 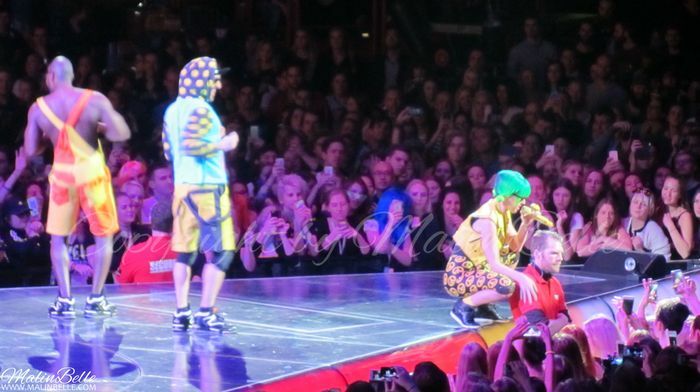 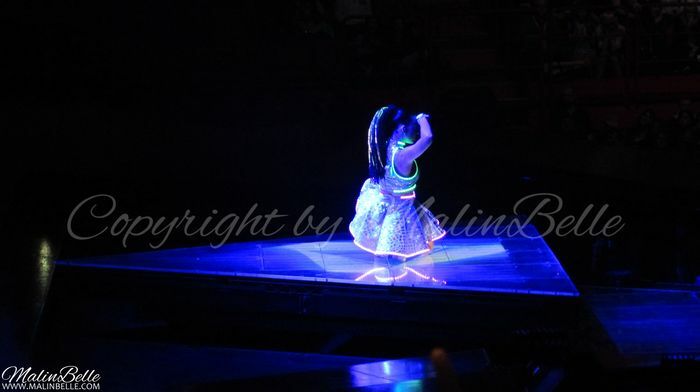 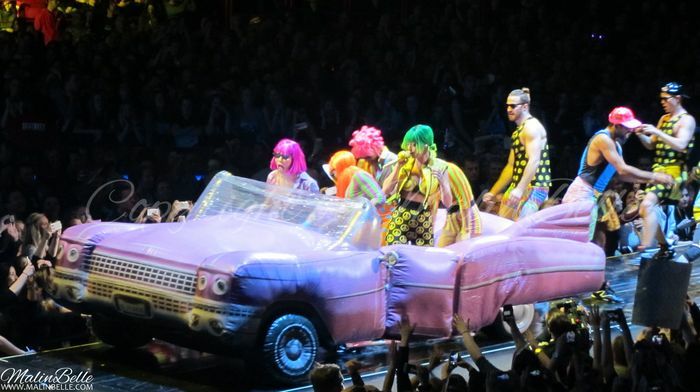 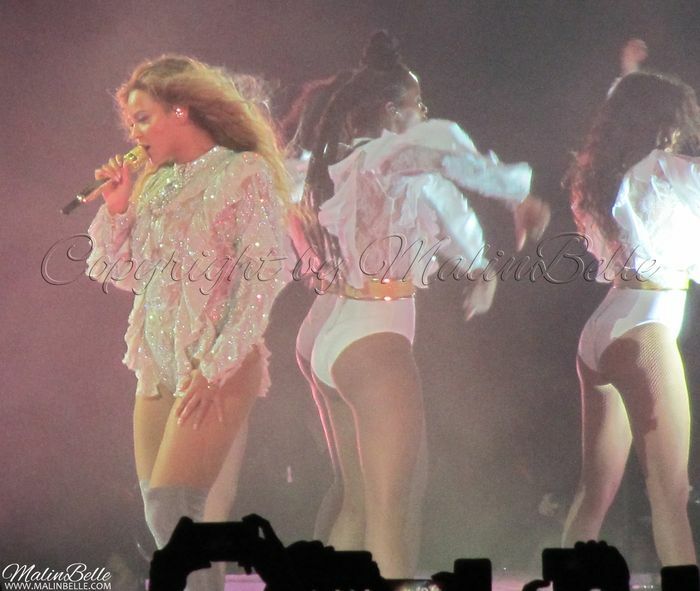 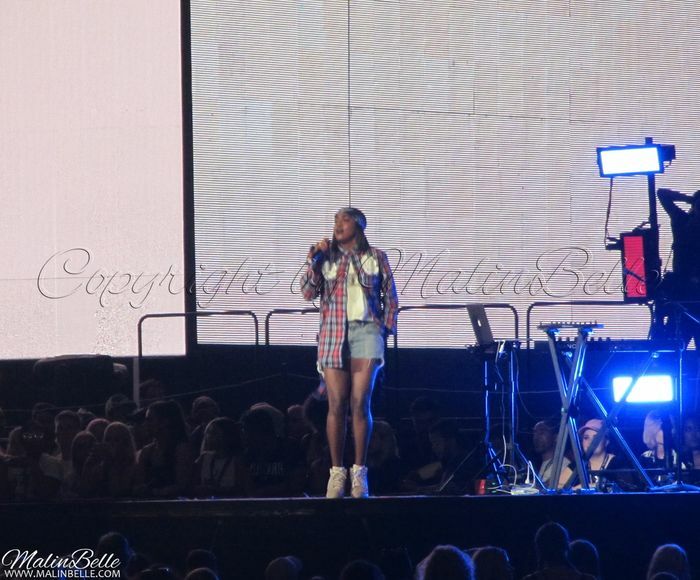 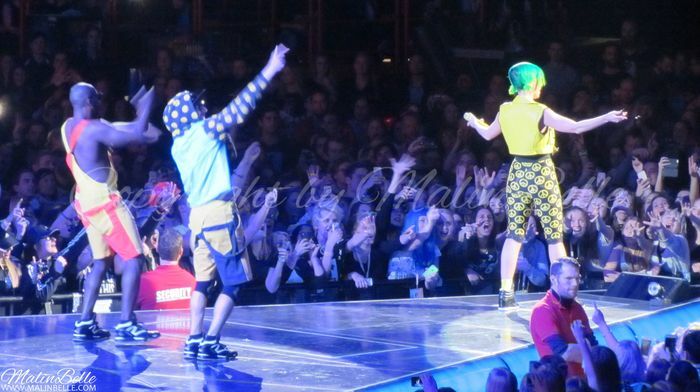 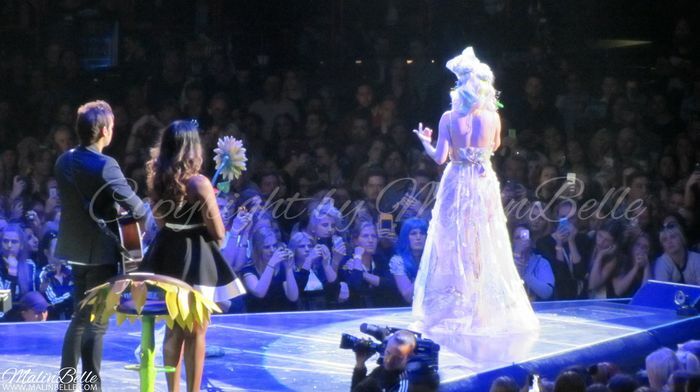 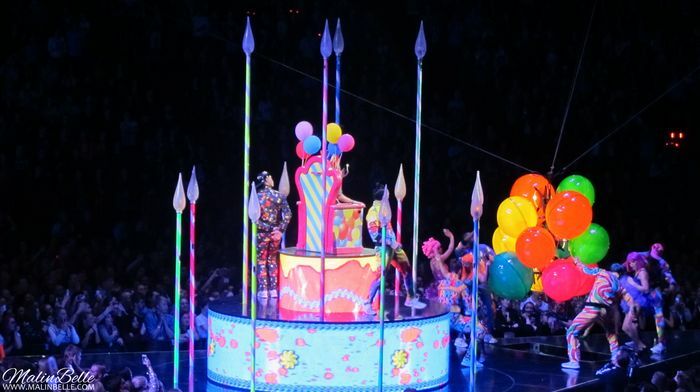 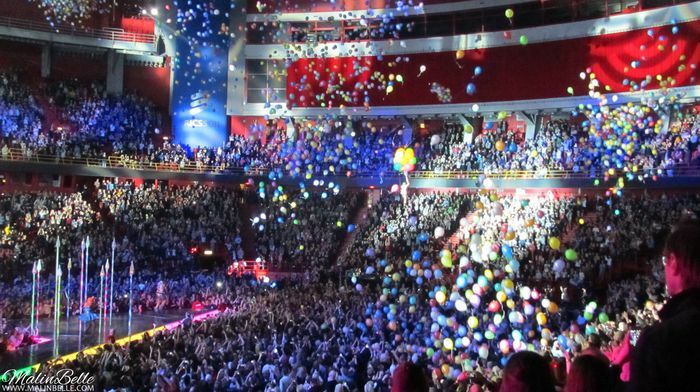 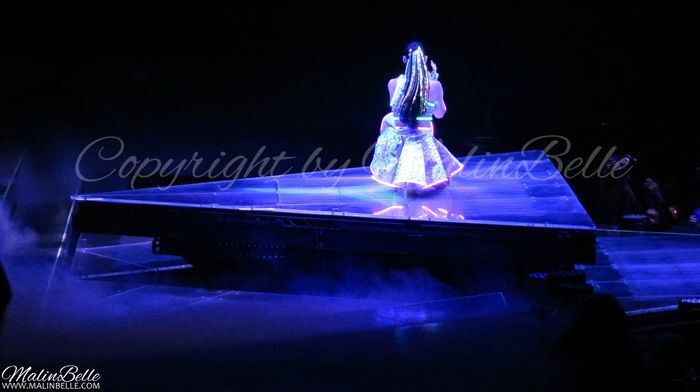 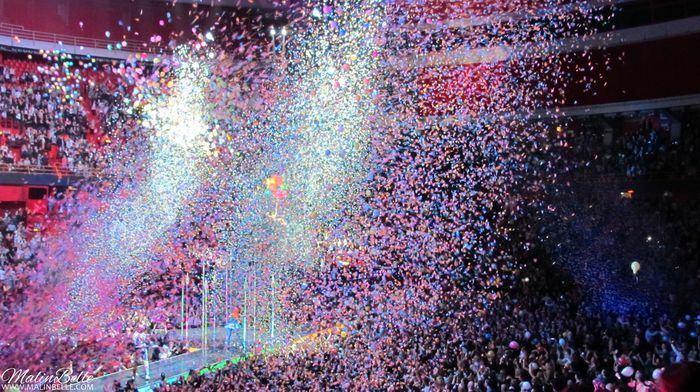 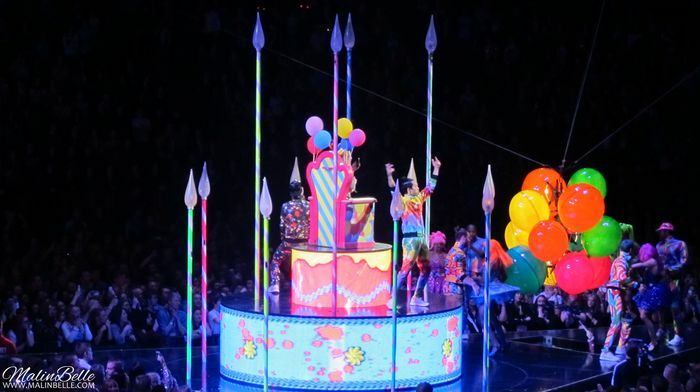 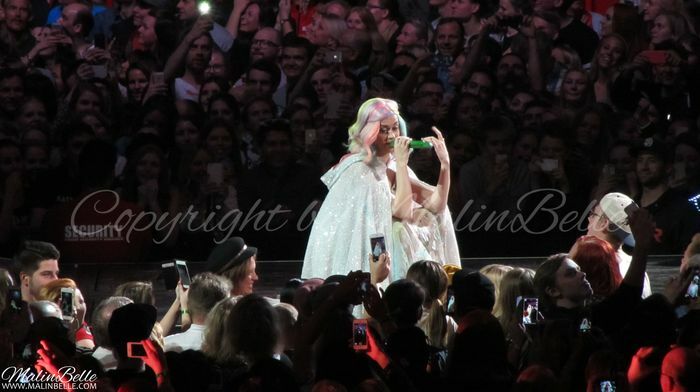 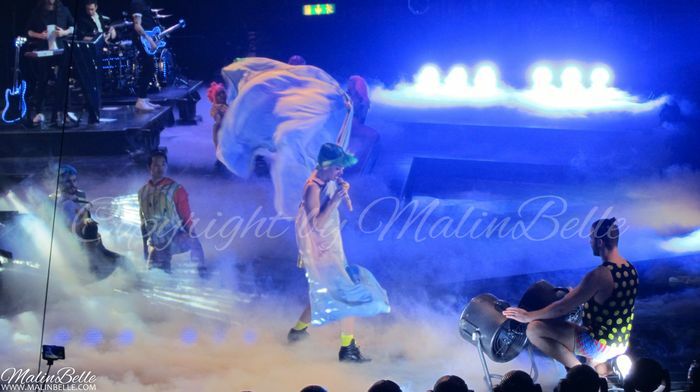 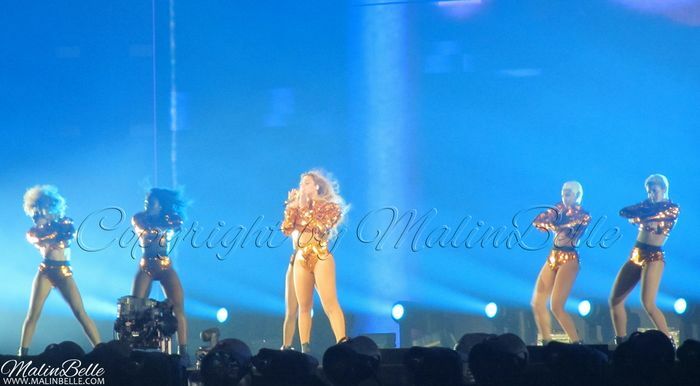 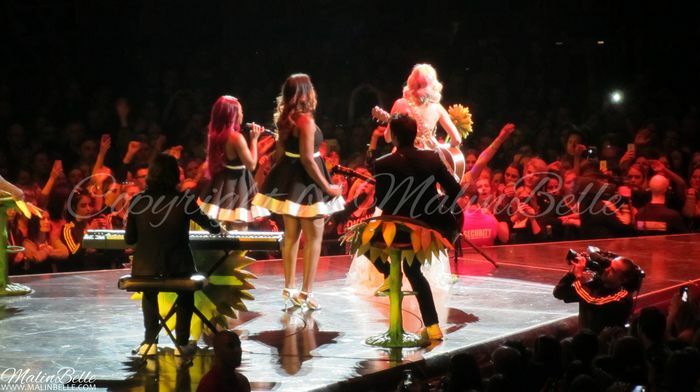 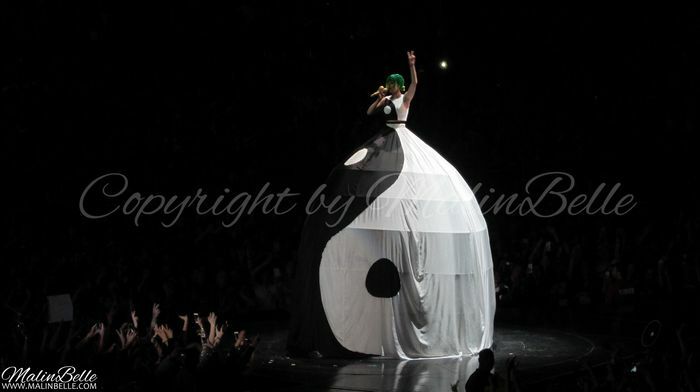 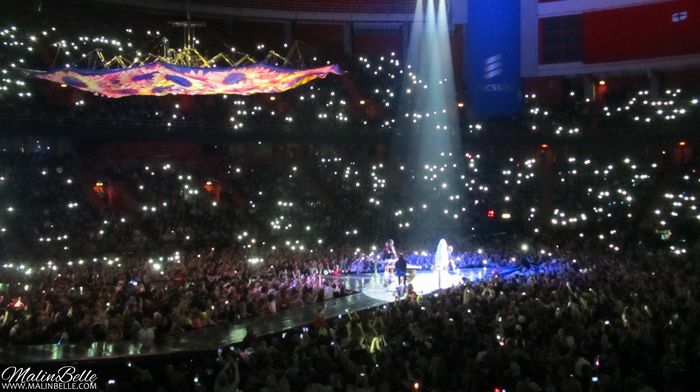 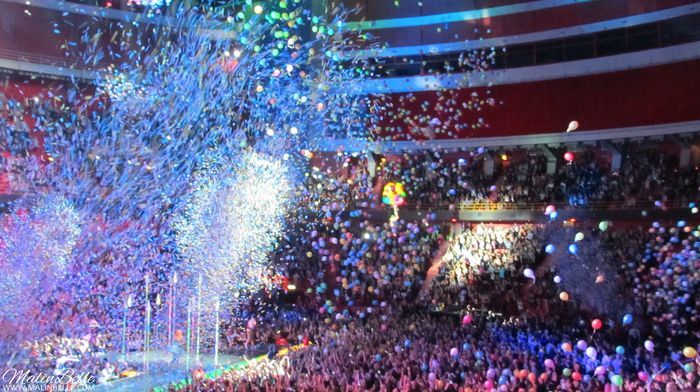 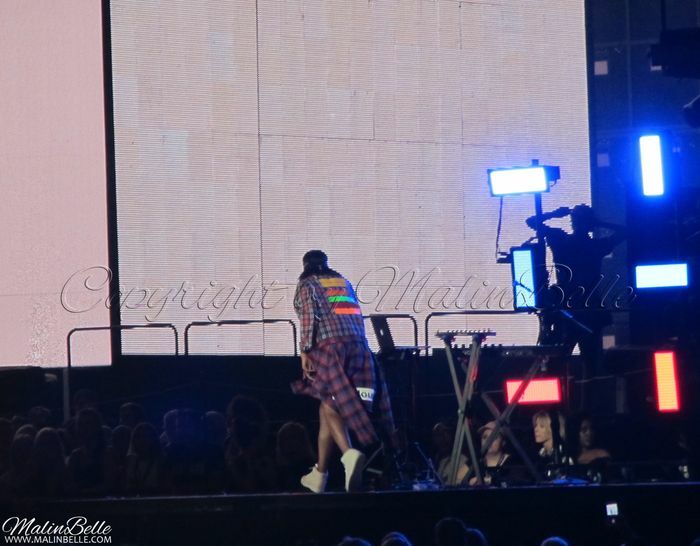 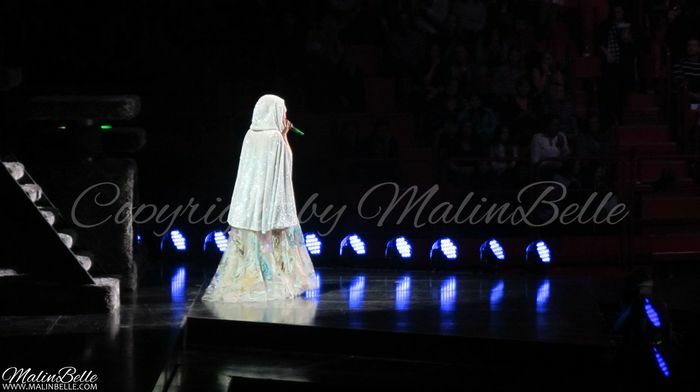 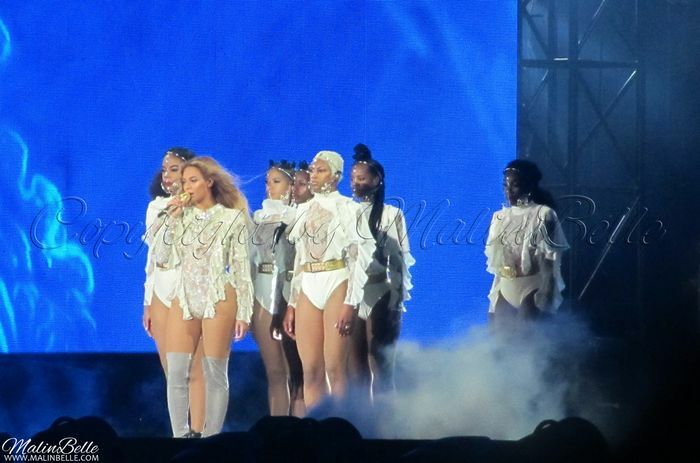 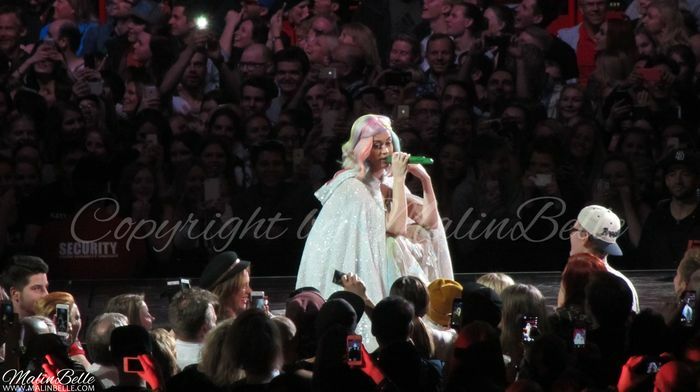 Katy Perry’s “The Prismatic World Tour” concert at Ericsson Globe in Stockholm, Sweden. 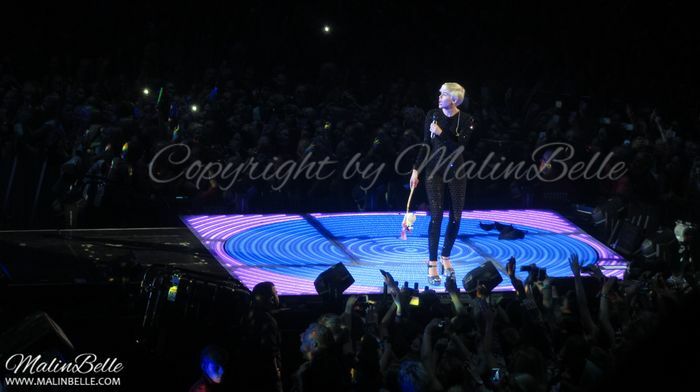 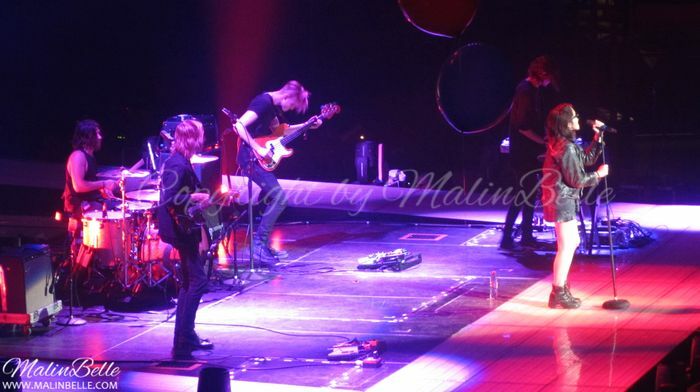 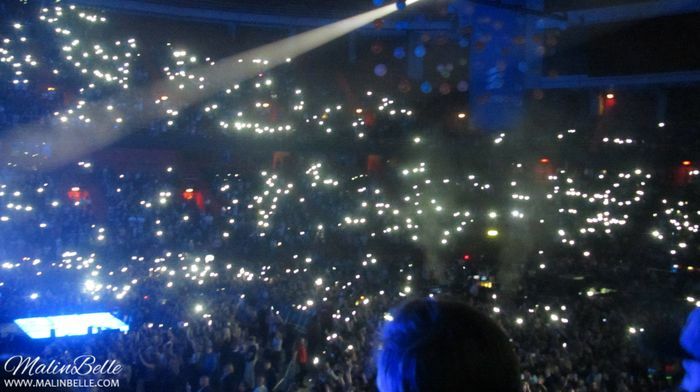 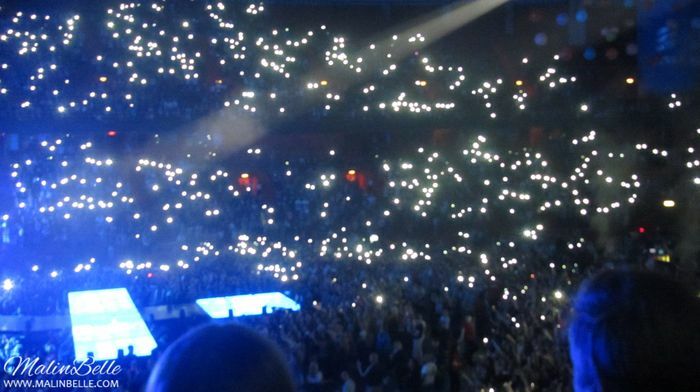 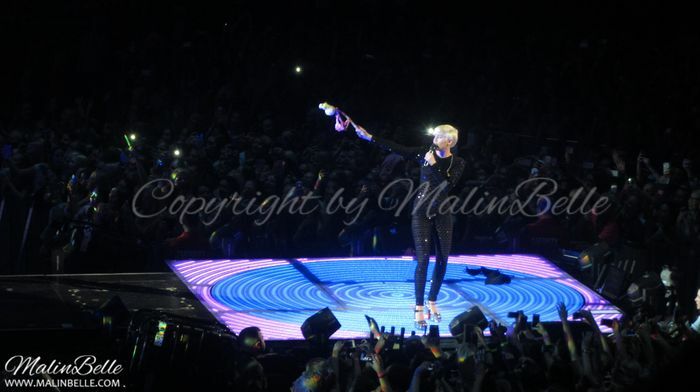 Miley Cyrus @ Ericsson Globe, Stockholm, Sweden. 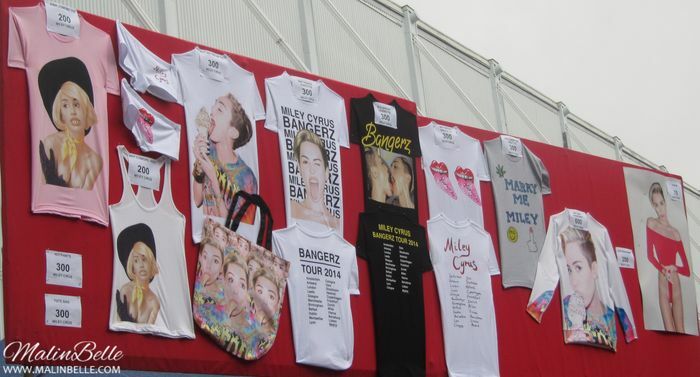 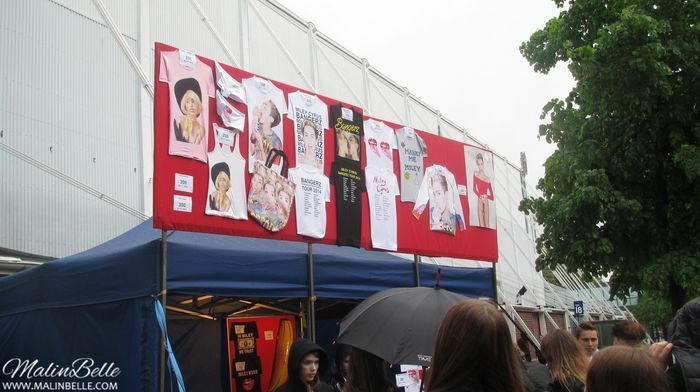 Miley Cyrus merchandise outside of Ericsson Globe. 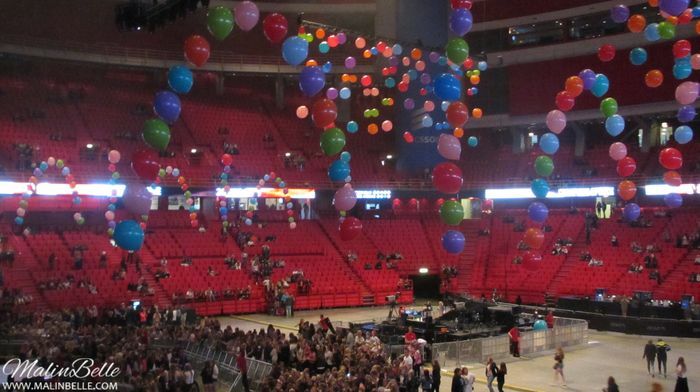 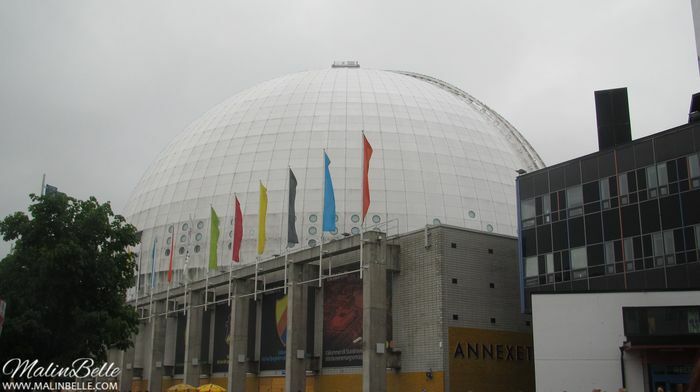 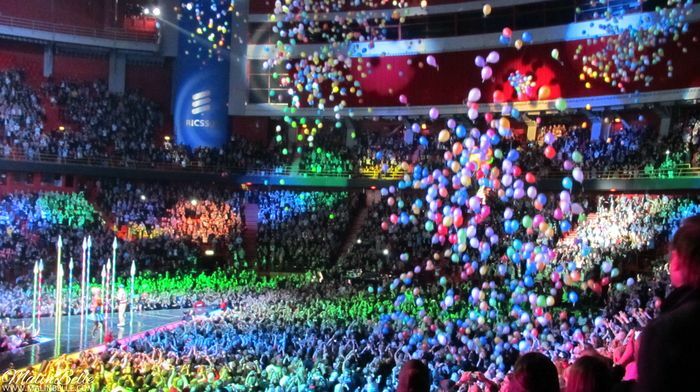 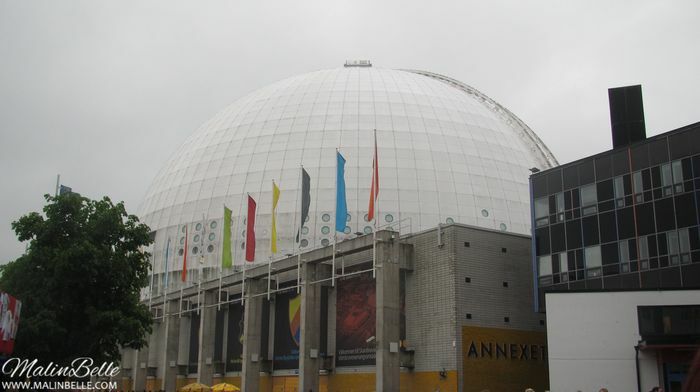 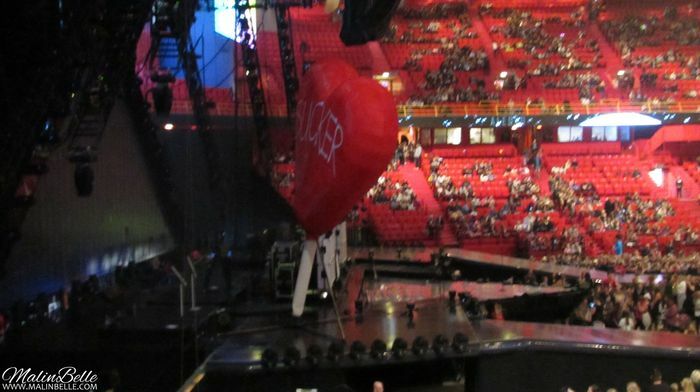 Ericsson Globe was decorated with balloons. 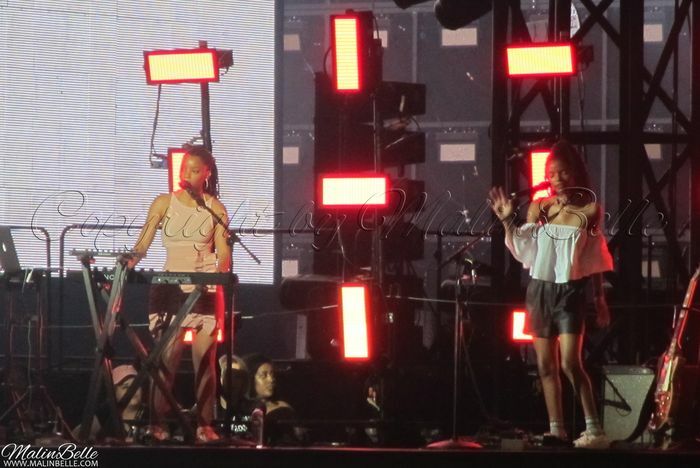 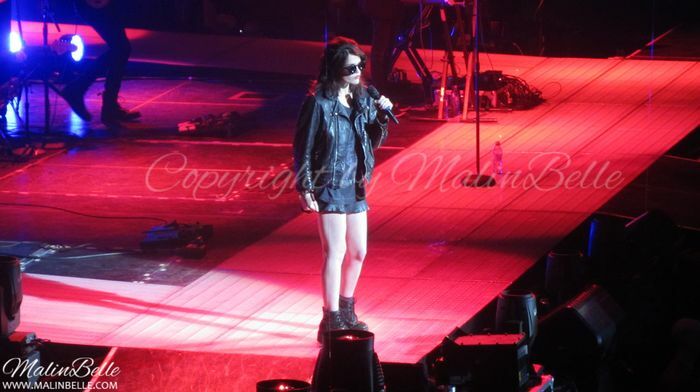 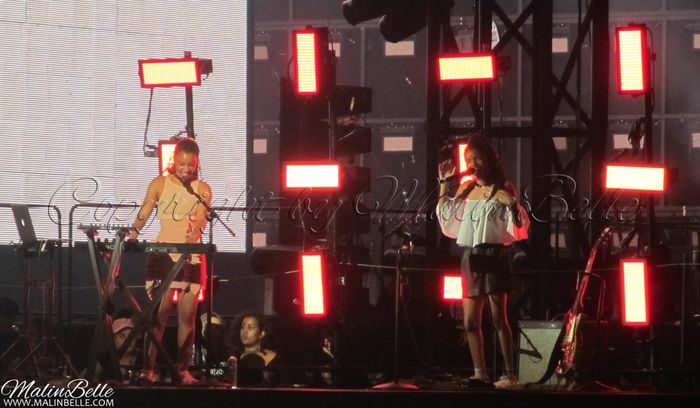 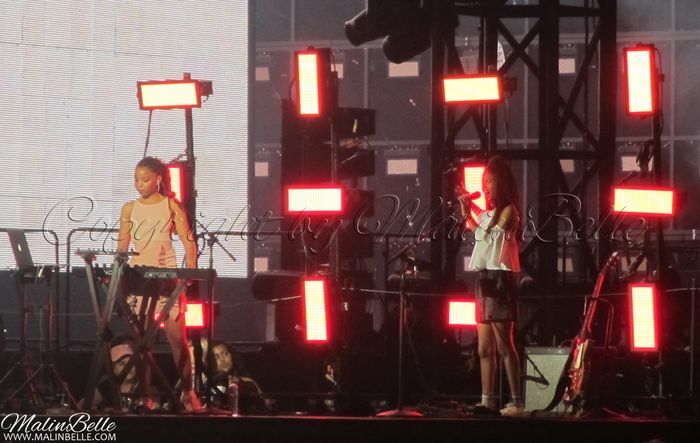 Sky Ferreira was the opening act for Miley Cyrus. 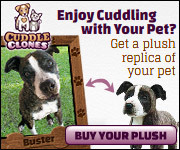 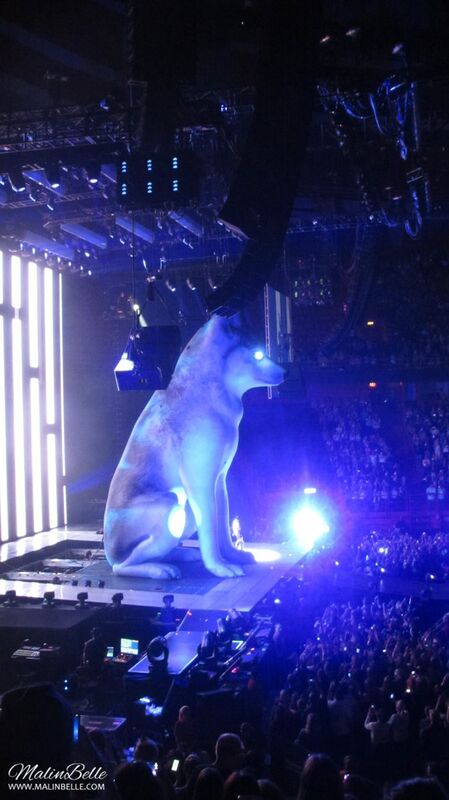 I think this huge dog is supposed to be Miley's dog Floyd that recently passed away. 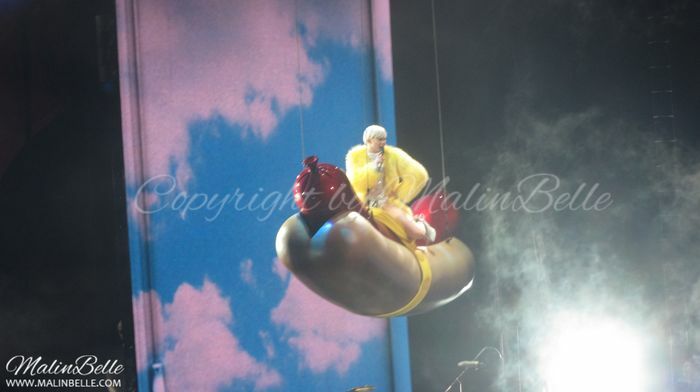 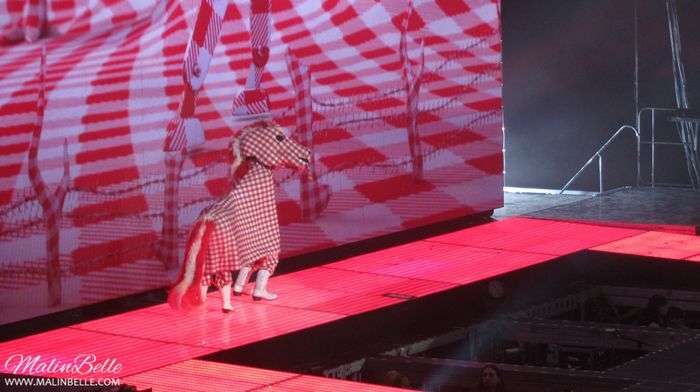 Miley talked a bit about him since the concert was on a Friday and she have written a lot about #FloydFriday on Twitter. 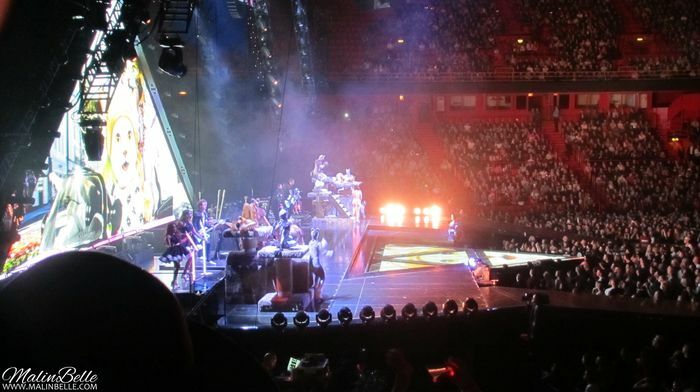 SMS (Bangerz) | 4x4 | Love Money Party | My Darlin' | Maybe You're Right | FU | Do My Thang | #GETITRIGHT | Can't Be Tamed | Adore You | Lucy in the Sky with Diamonds (The Beatles cover) | Drive | Rooting For My Baby | Summertime Sadness (Lana Del Rey cover) | There Is A Light That Never Goes Out (The Smiths cover) | Jolene (Dolly Parton cover) | 23 | On My Own | Someone Else. 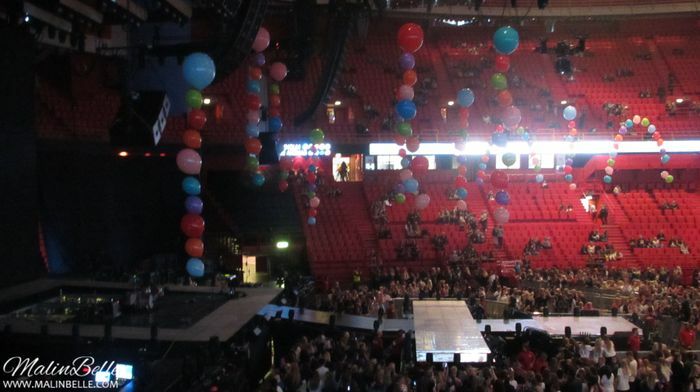 We Can't Stop | Wrecking Ball | Party In The U.S.A.
Miley Cyrus “Bangerz Tour” concert at Ericsson Globe in Stockholm, Sweden. 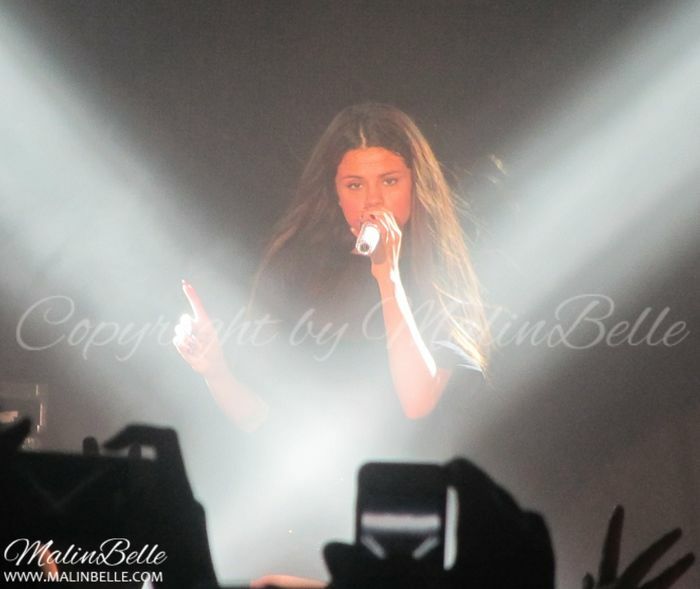 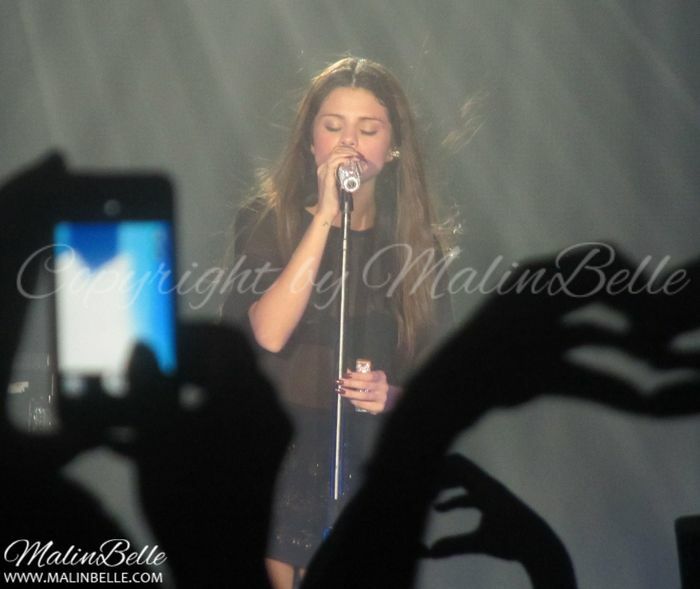 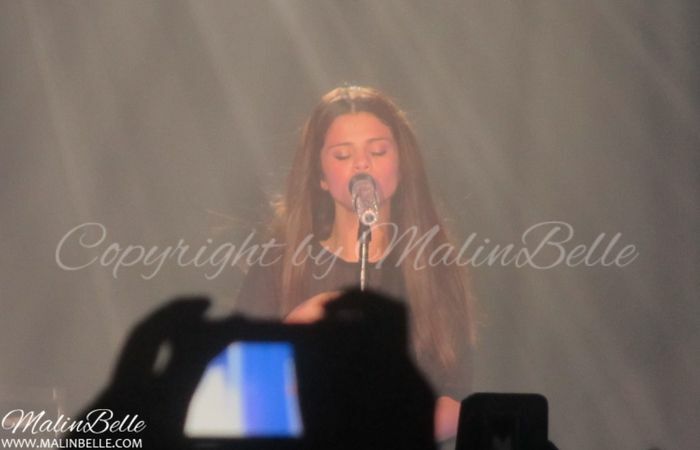 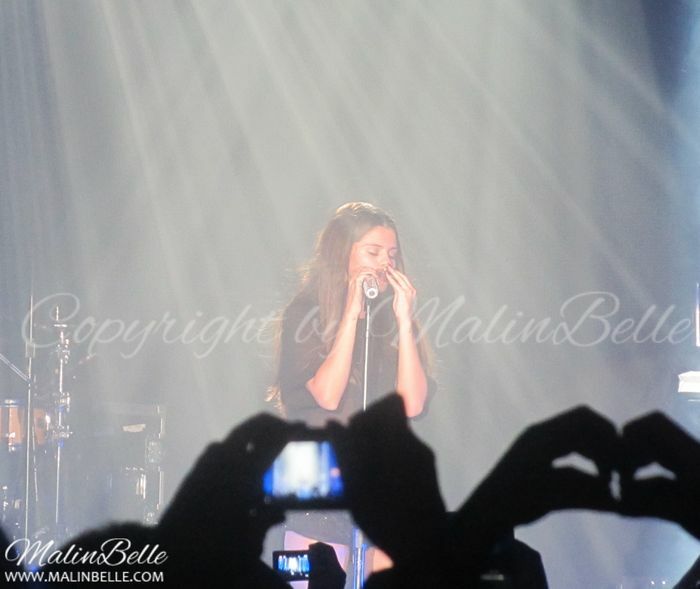 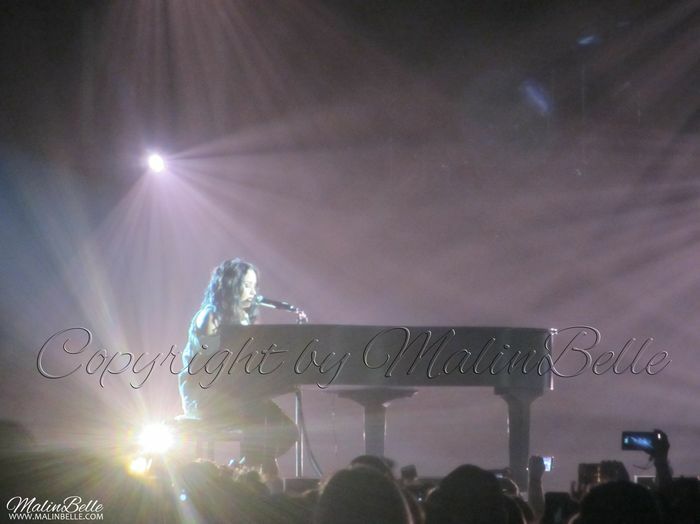 Selena Gomez @ Fryshuset, Stockholm, Sweden. 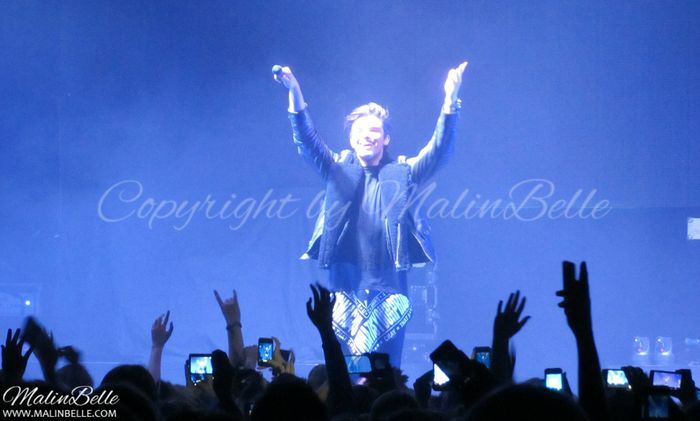 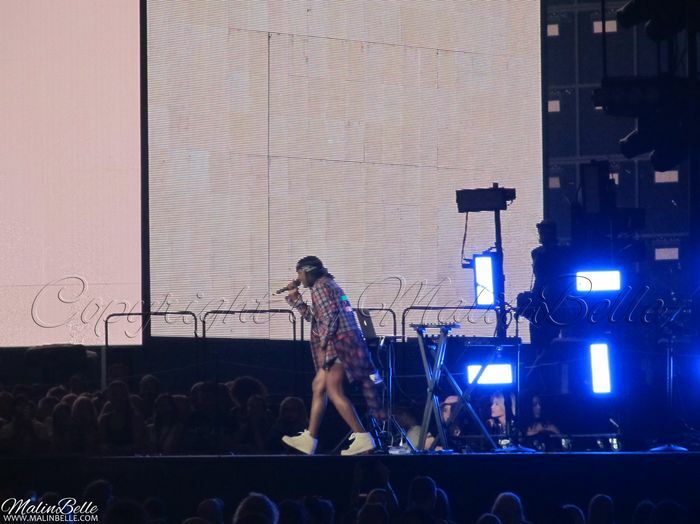 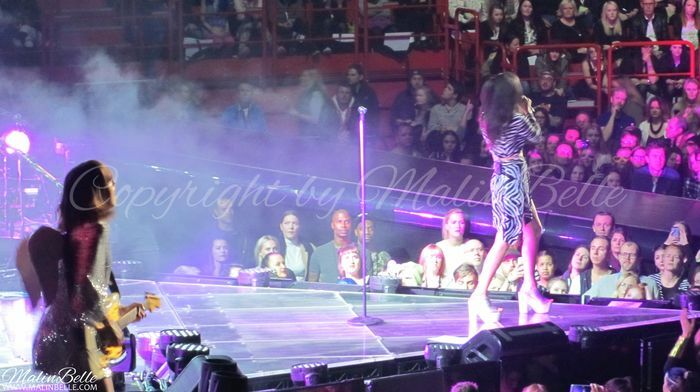 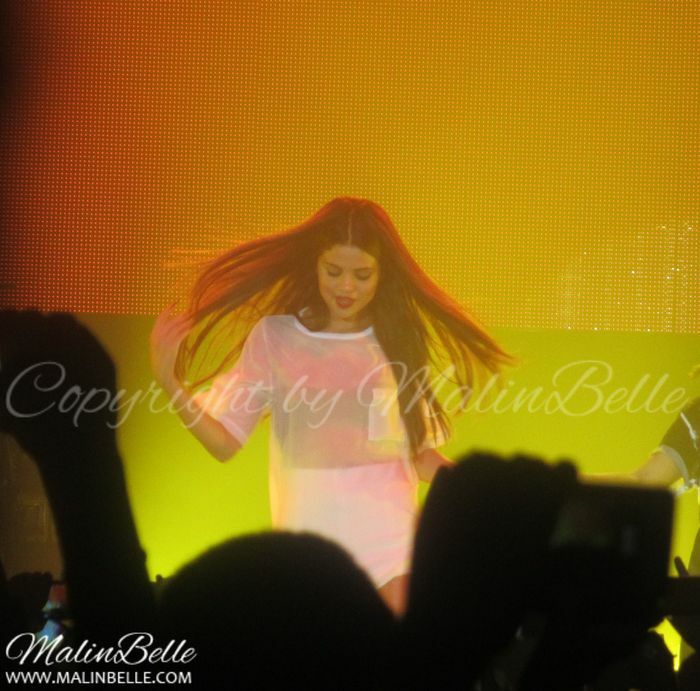 The Swedish artist Anton Ewald was the opening act for Selena Gomez. 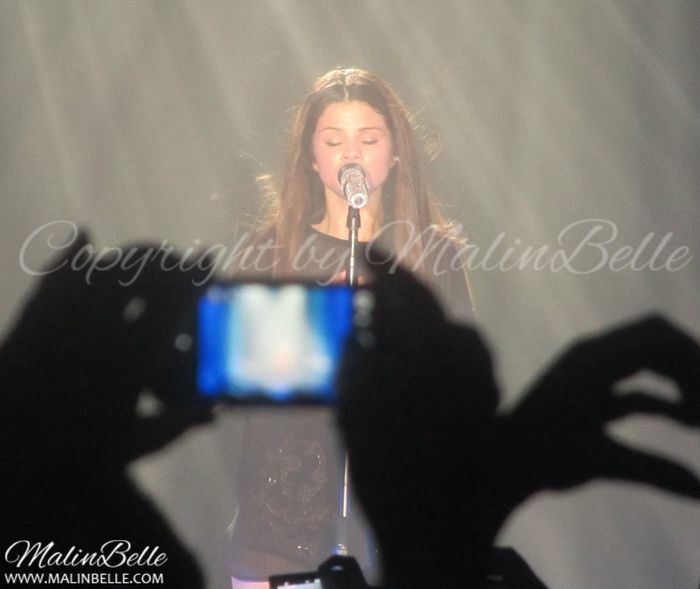 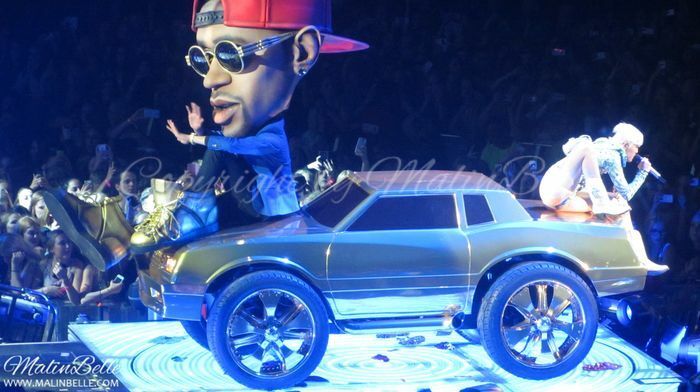 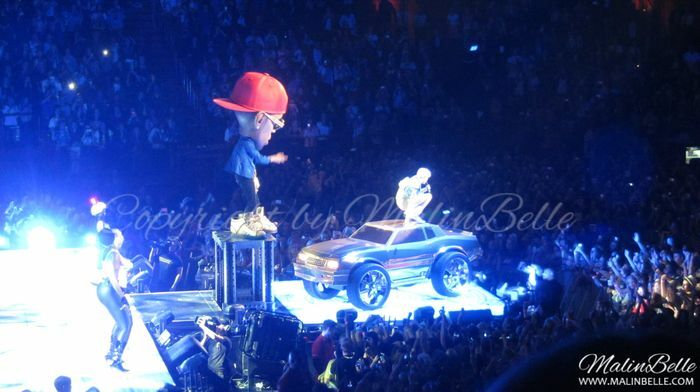 He performed his song “Begging” and the 5 songs from his EP “A”. 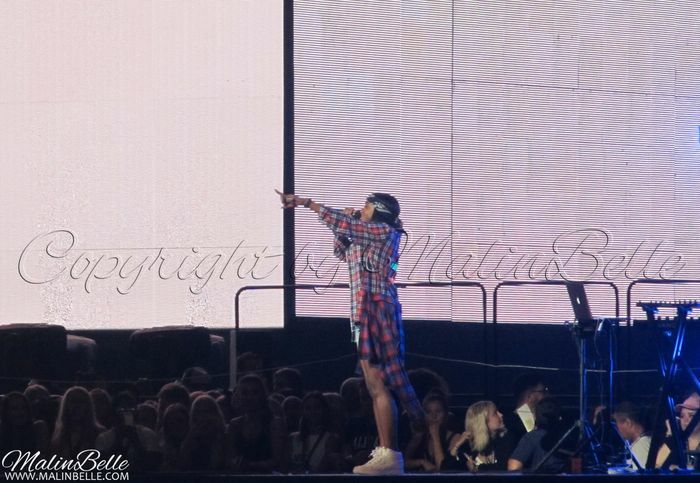 Bang Bang Bang | Round & Round | Like a Champion | B.E.A.T. 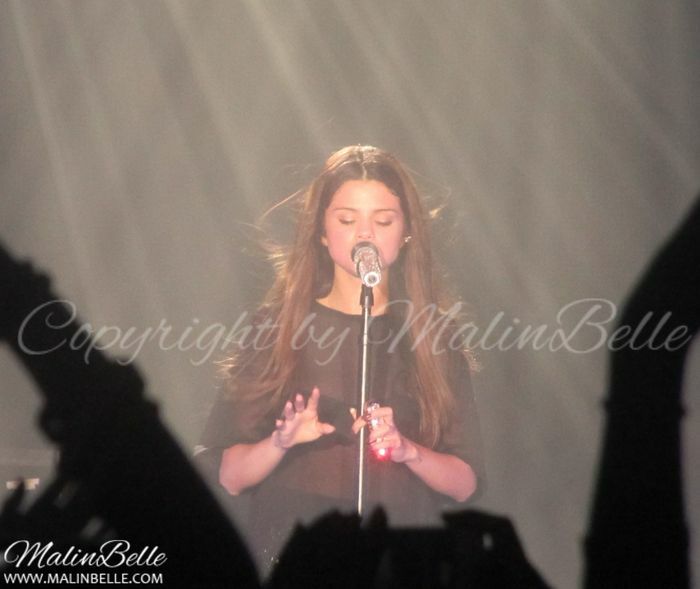 | Stars Dance | Write Your Name | Birthday | Love You Like a Love Song | Love Will Remember | Dream (Priscilla Ahn cover) | Royals (Lorde cover) | Who Says | Whiplash | Naturally | Undercover | Save The Day | A Year Without Rain. 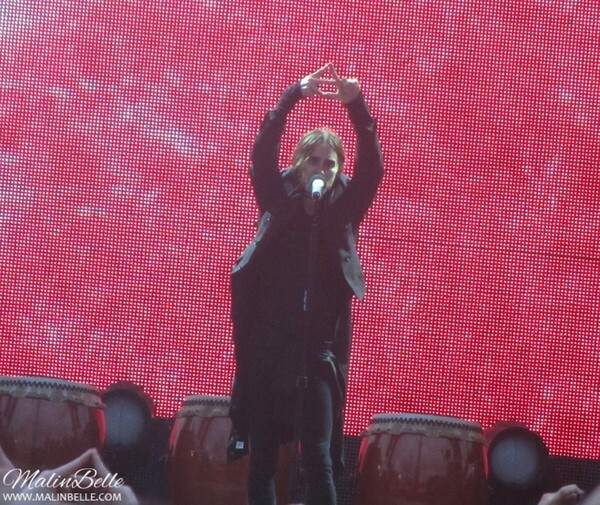 Come & Get It | Slow Down. 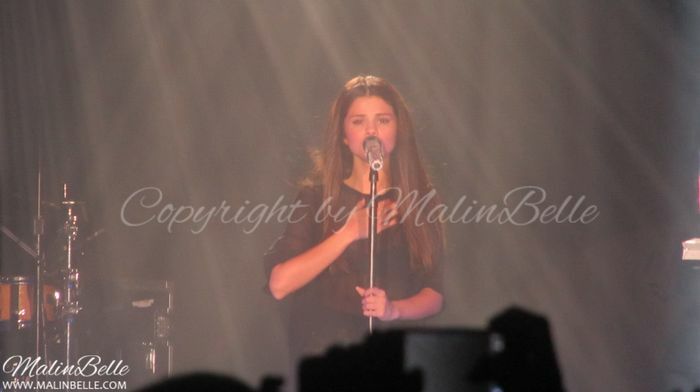 Unfortunately I didn't get so many good photos of Selena, which I'm a bit sad about. 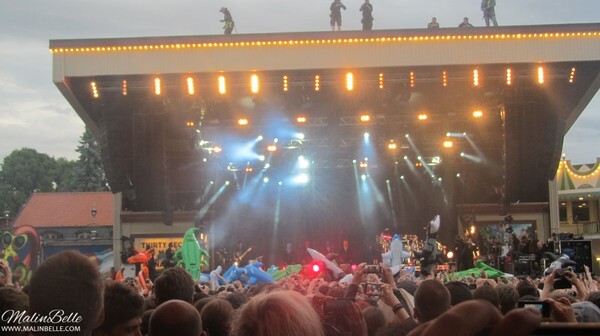 But it was hard to take any photos at all since there were people everywhere and not to mention tall people and people on each other's shoulders, which you can see in every photo above. 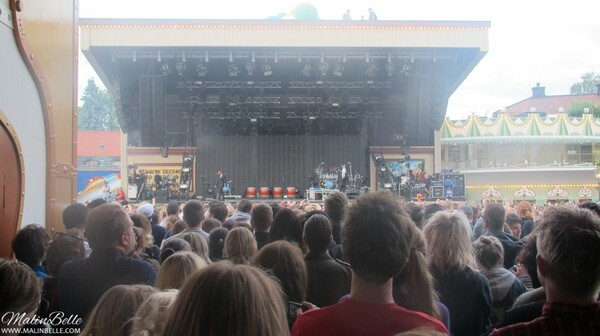 And since I'm short I couldn't have avoided getting some of the crowd in the photos either. 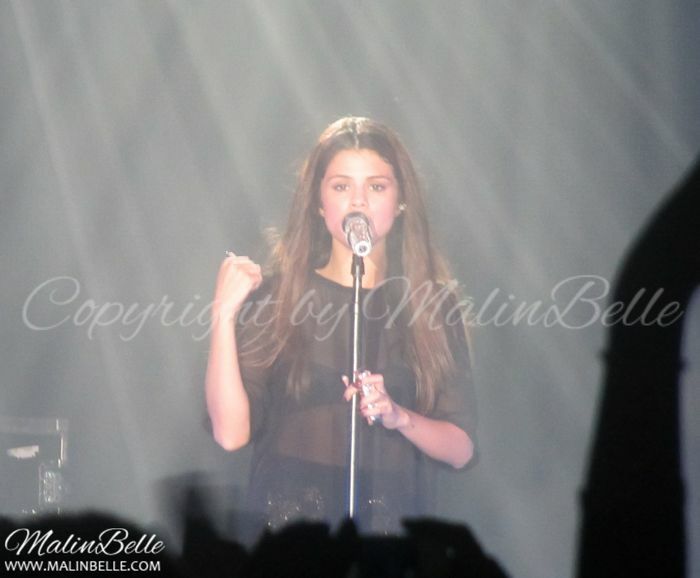 At least I have a few photos of Selena, so I guess I should be happy about that. 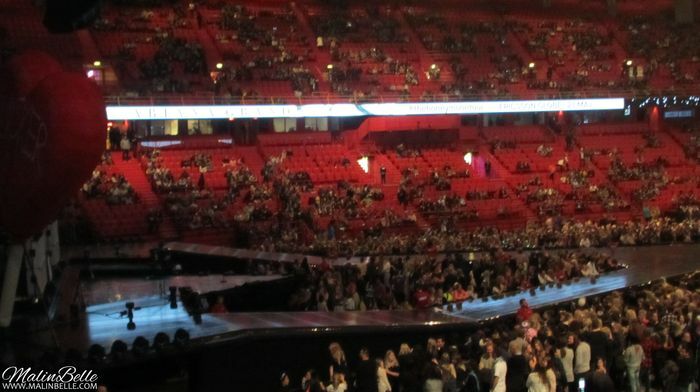 I hope I'll get to see Selena again sometime in a bigger arena because it was really hot inside Arenan/Fryshuset and I suspect that they had more people in the arena than they should have had. 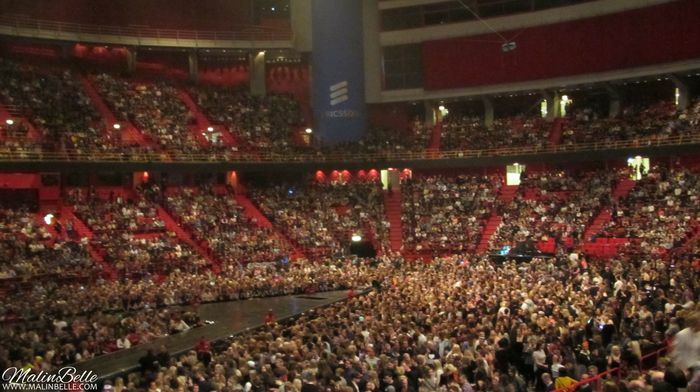 I also know that they released more tickets just some weeks before the concert so that just makes me suspect that even more. 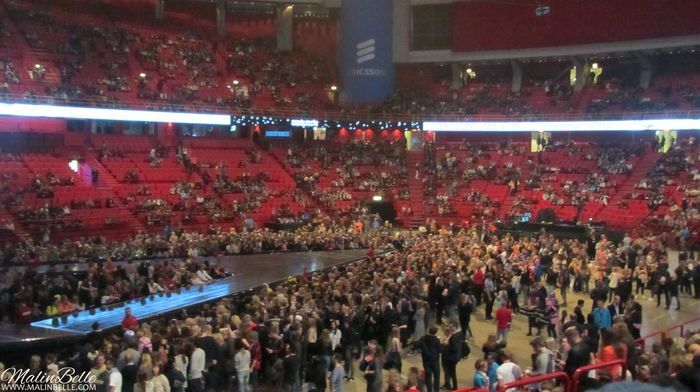 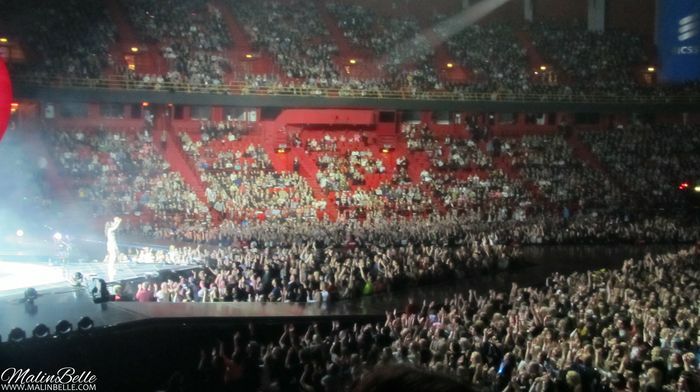 I've also been in Arenan/Fryshuset at 2 concerts before and those time it wasn't as crowded as it was yesterday at Selena's concert. 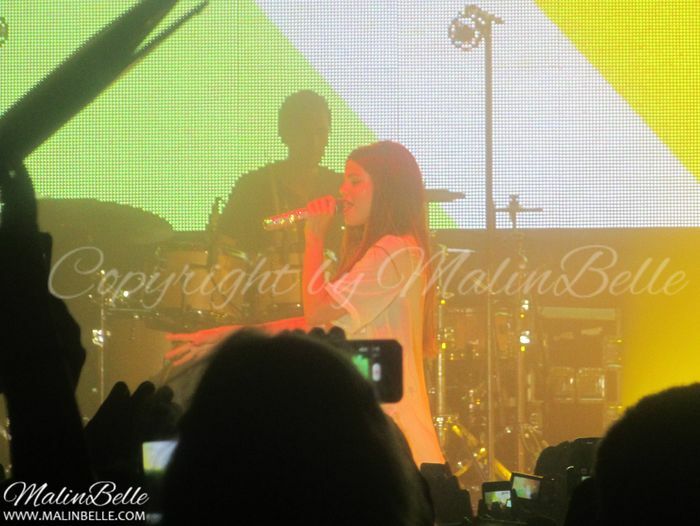 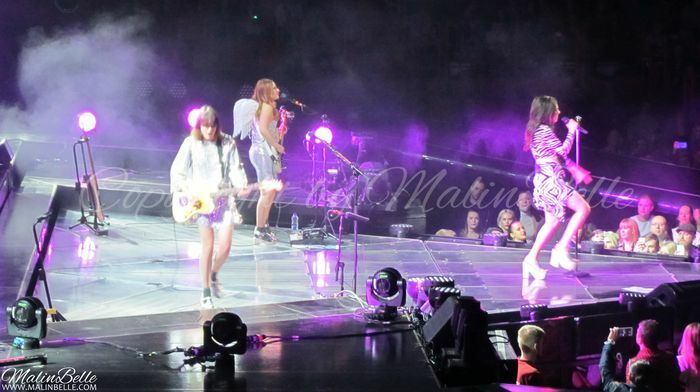 Selena Gomez @ Arenan/Fryshuset, Stockholm, Sweden. 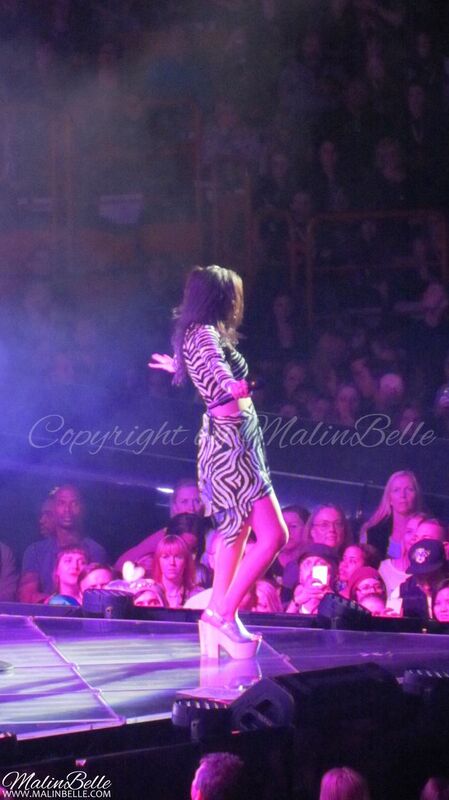 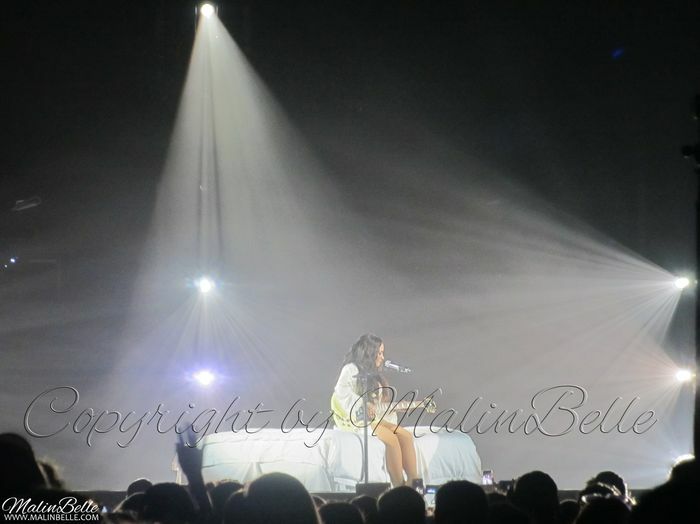 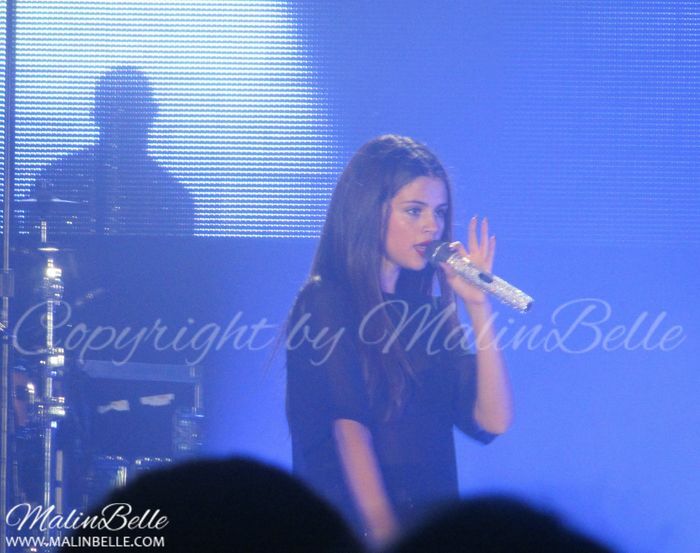 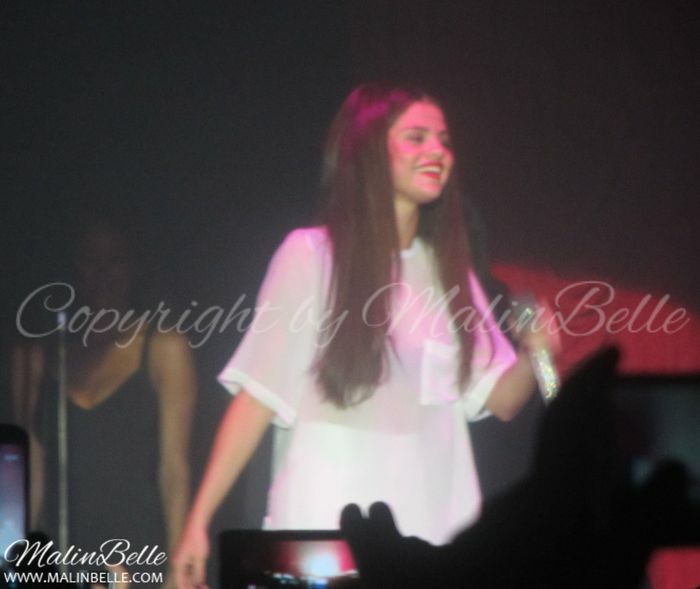 Selena Gomez “Stars Dance Tour” concert at Arenan/Fryshuset in Stockholm, Sweden. 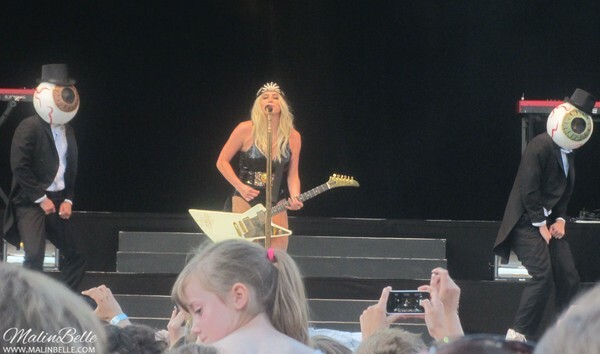 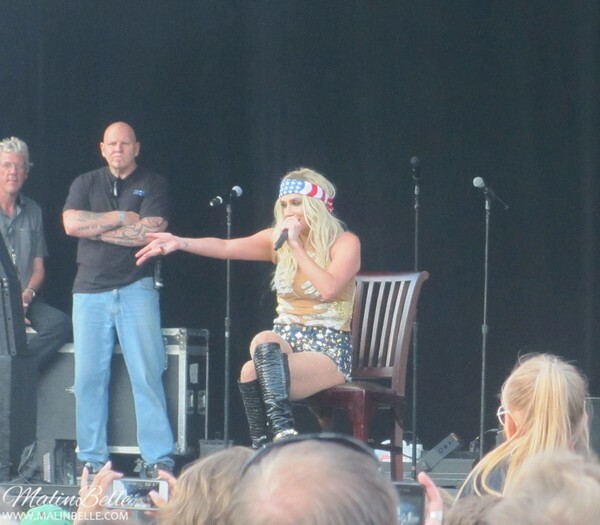 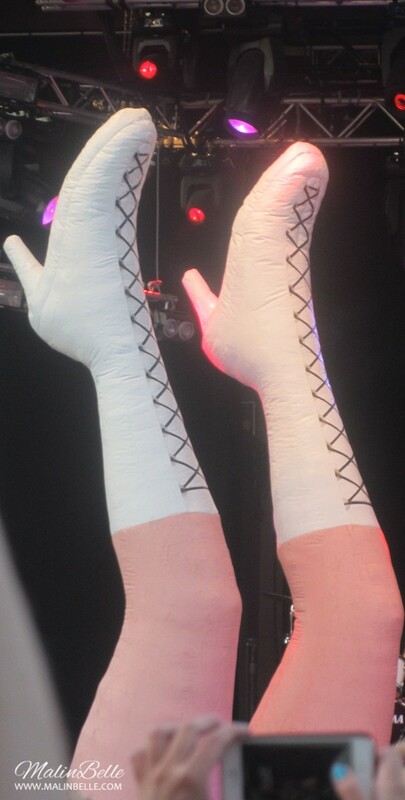 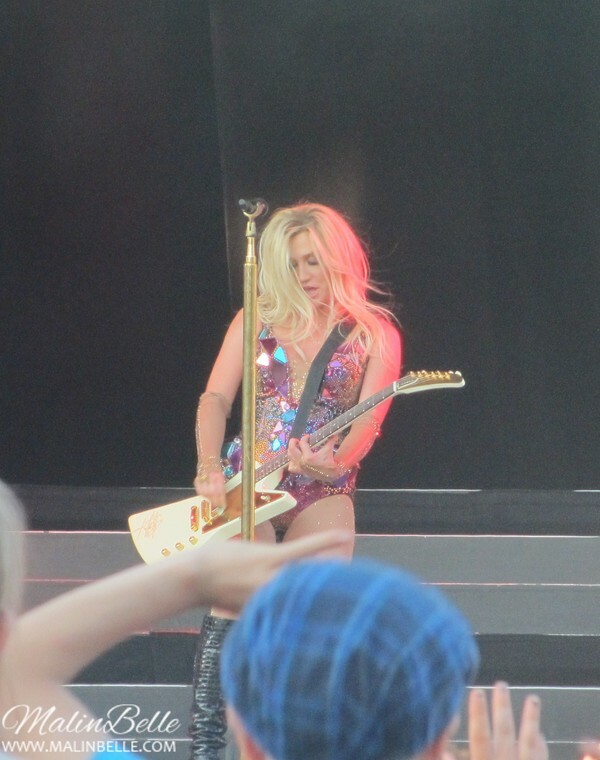 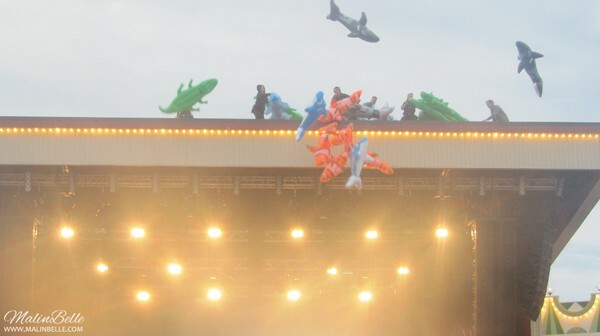 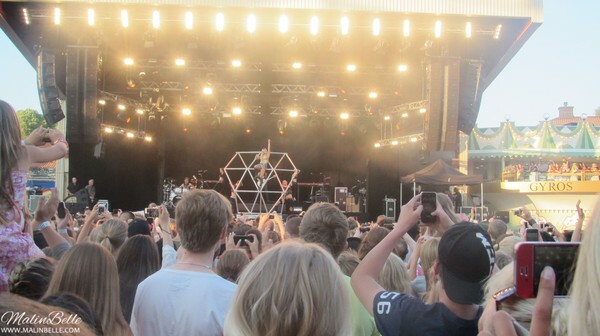 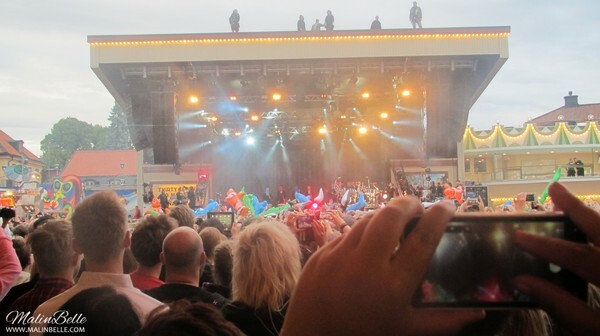 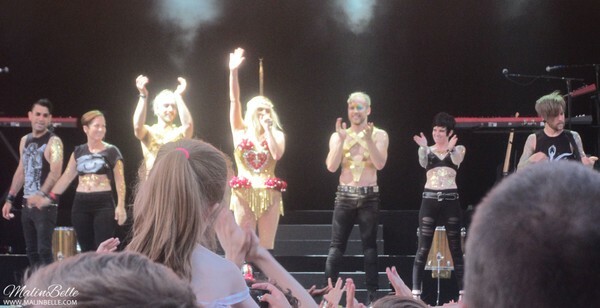 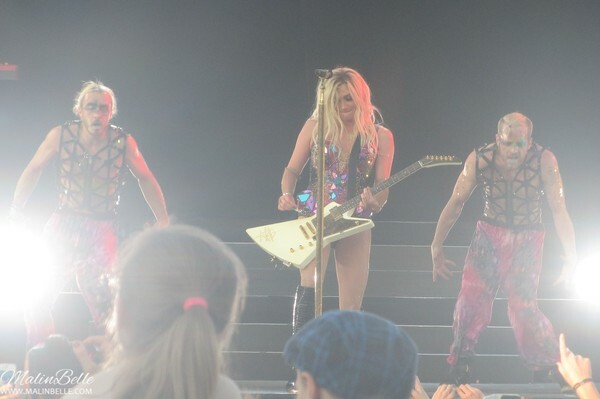 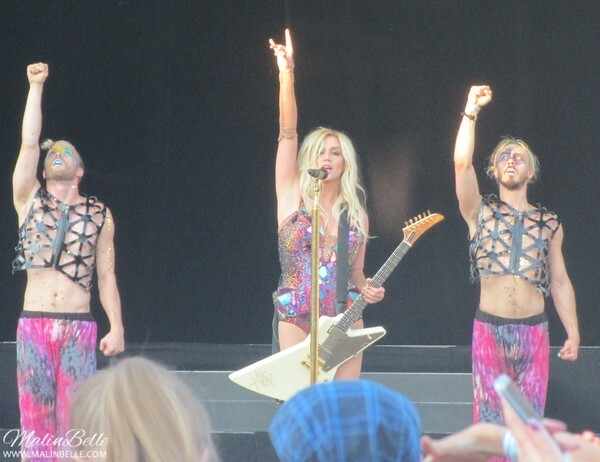 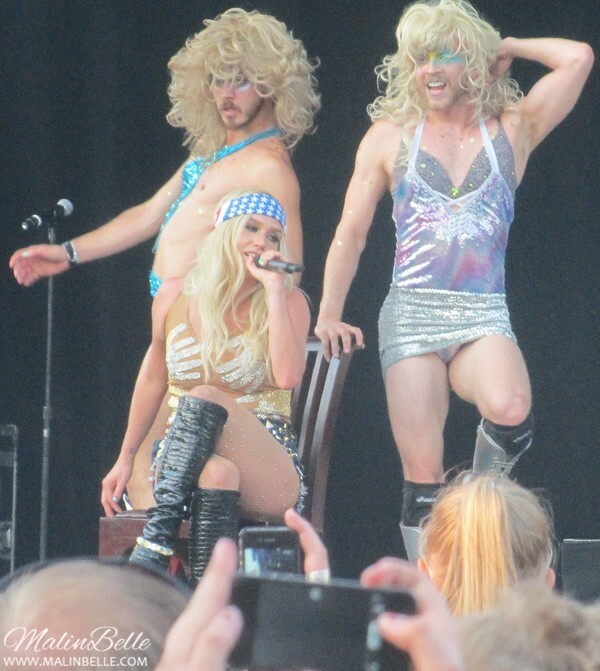 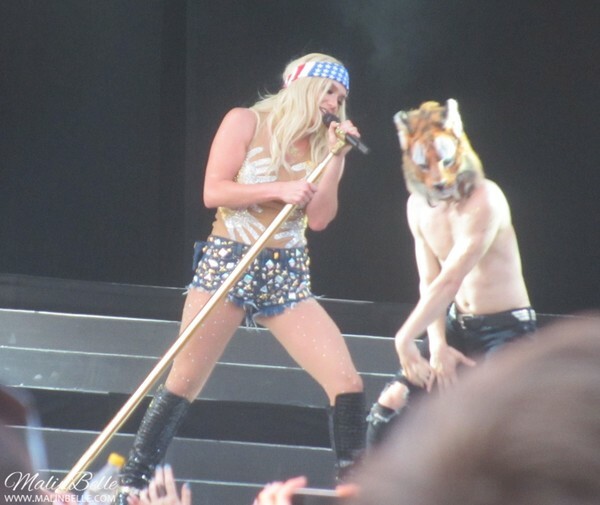 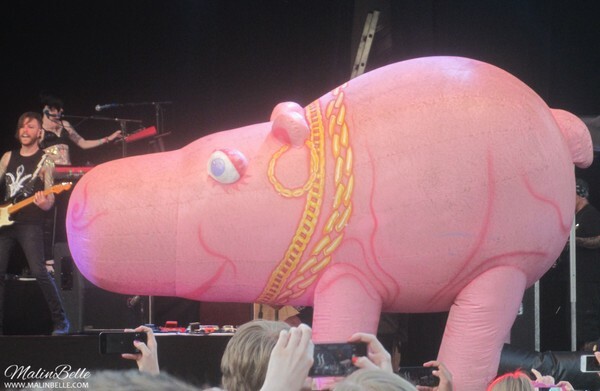 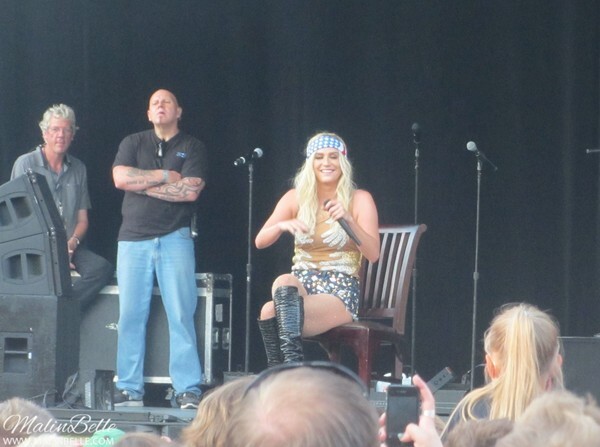 Kesha’s “Warrior Tour” concert at Gröna Lund in Stockholm, Sweden. 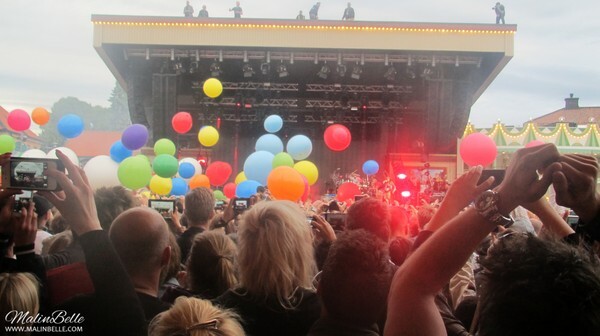 30 Seconds To Mars @ Gröna Lund, Stockholm, Sweden. 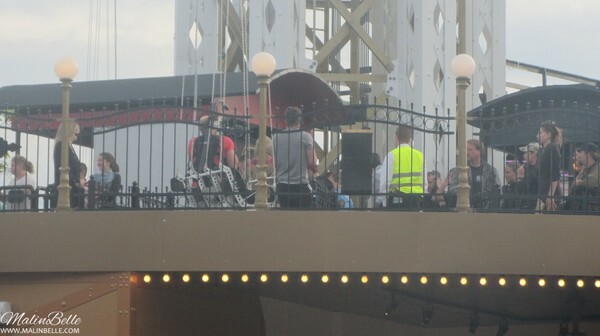 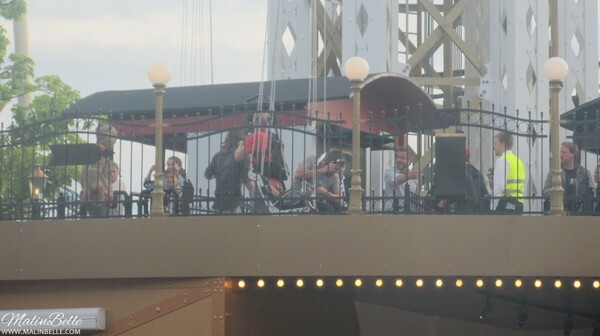 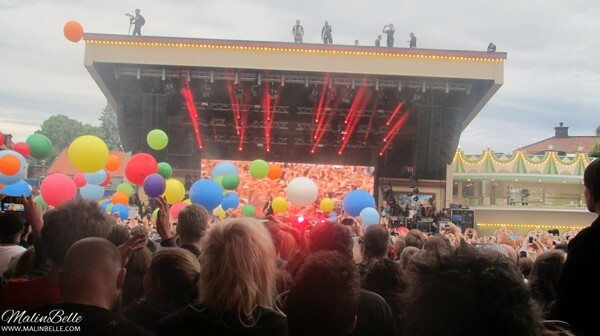 Jared and Shannon went on the new ride at Gröna Lund, which is called Eclipse. 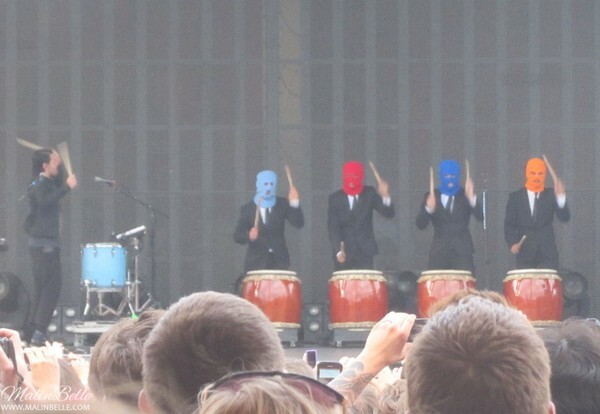 Me and my Dad almost walked into them when they went there with the guards. 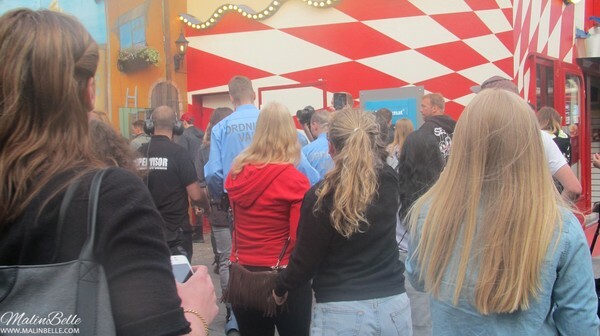 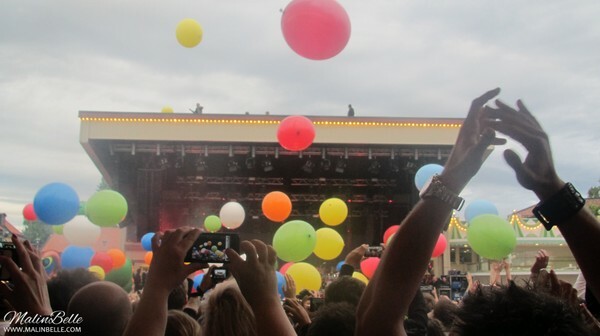 We were just walking towards the stage and if you've ever been at Gröna Lund you know it's usually really crowded there so some people came towards us who we almost walked into and then I realized it was Jared and Shannon! 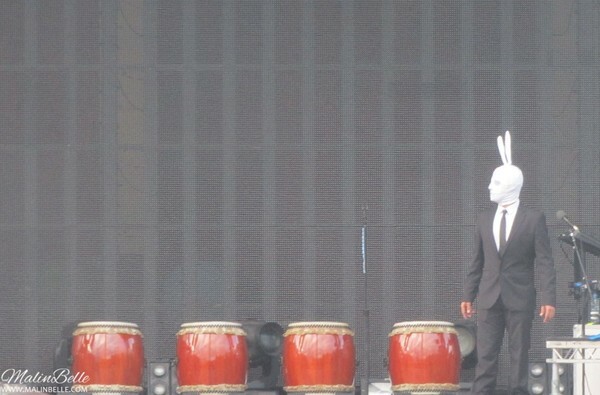 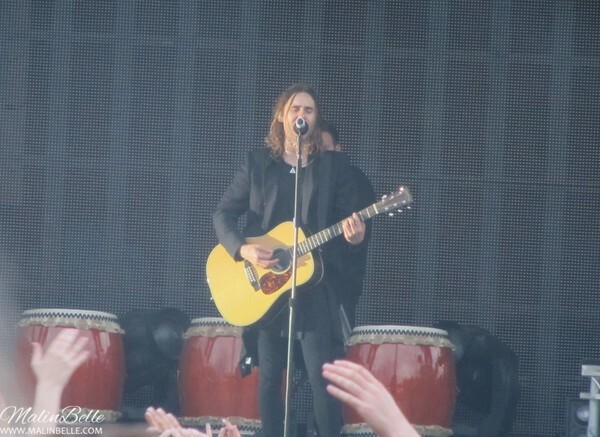 ♥ If it hadn't been for the guards next to them I would have walked right into Jared and Shannon so I was honestly just 1-2 meter away from them. 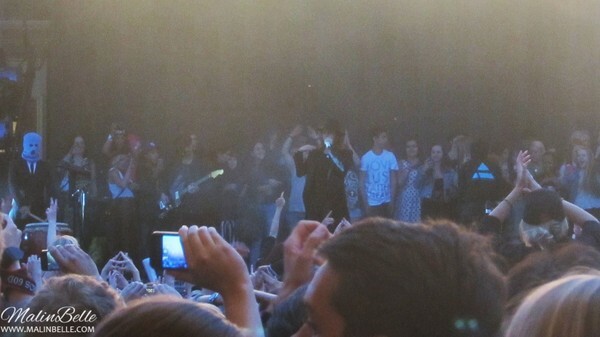 So I was happy with the concert before it had even started, as I'm sure you can imagine. 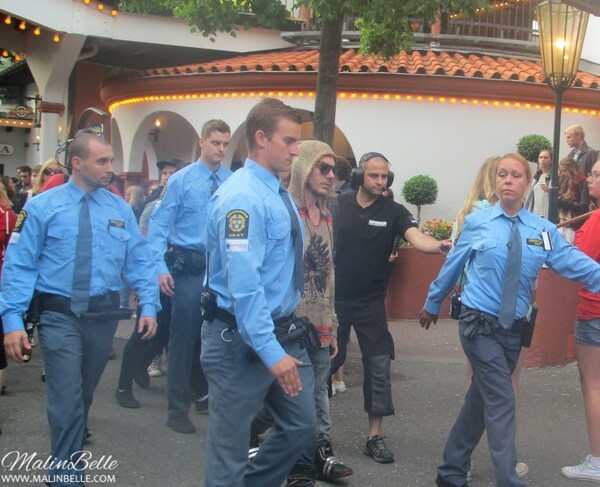 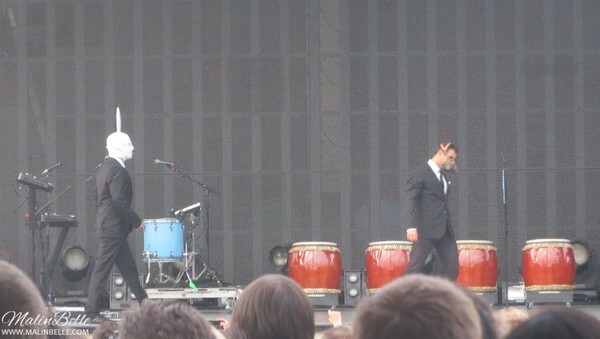 Jared and Shannon walking back from Eclipse with the guards to go backstage. 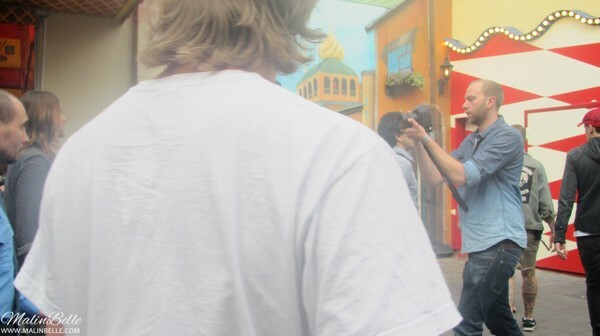 Apparently I wasn't quick enough to take some good photos of them and then some guy went in front of the camera as you can see in the photo above. 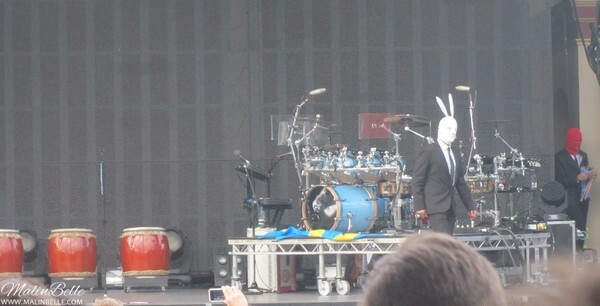 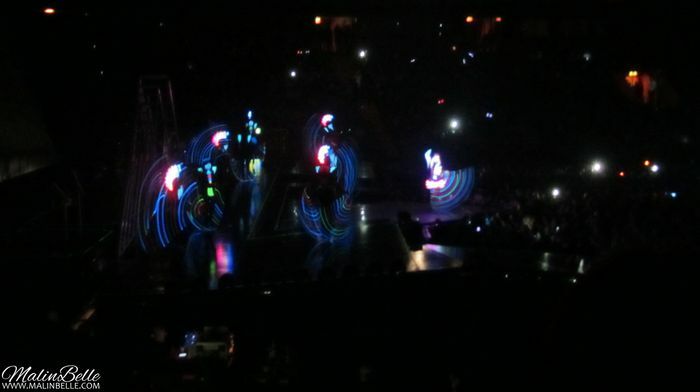 But at least I got to see them up close 2 times before the concert had even started! 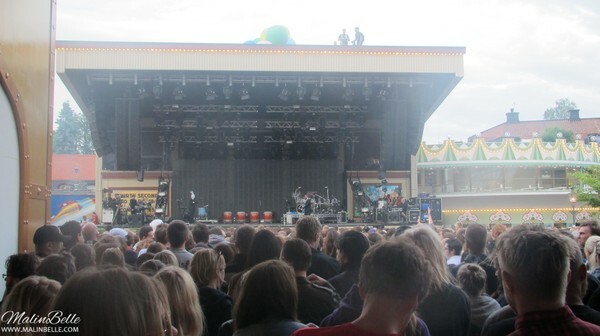 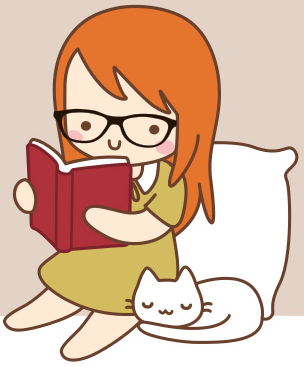 Which was extra nice since we ended up very far from the stage, and since I'm short (158 cm/5'2) I couldn't see very well but the concert was great anyway. 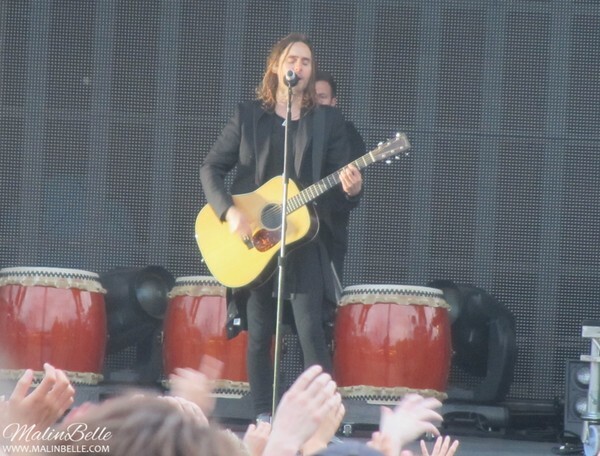 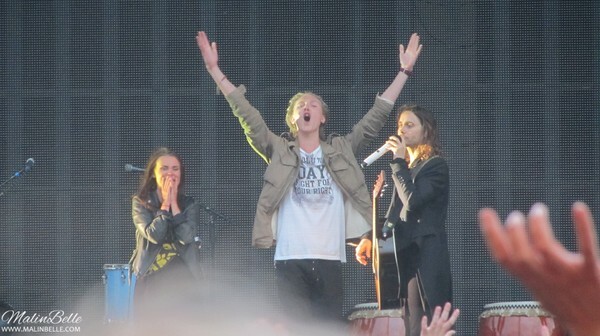 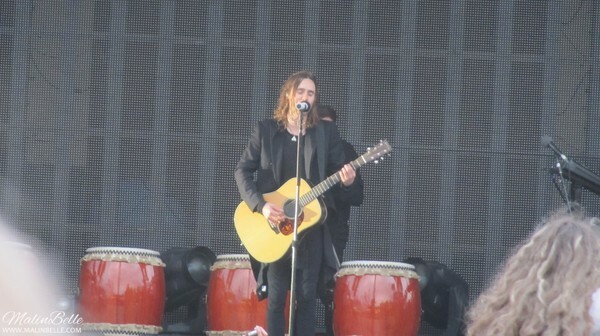 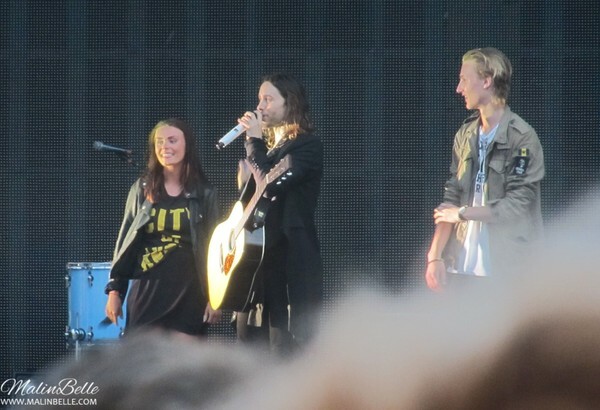 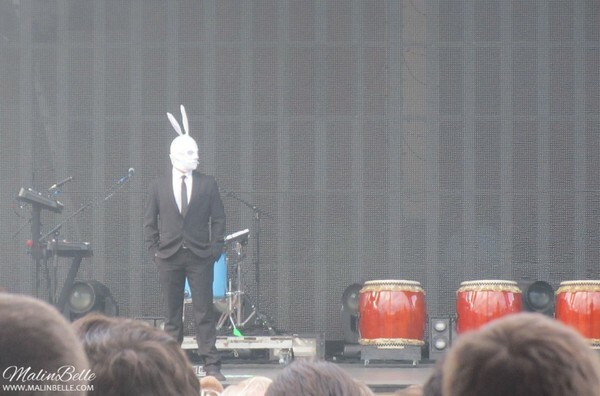 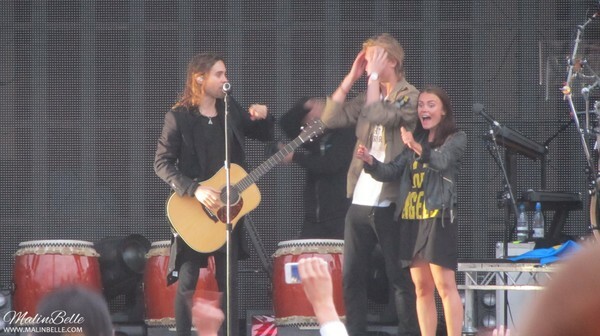 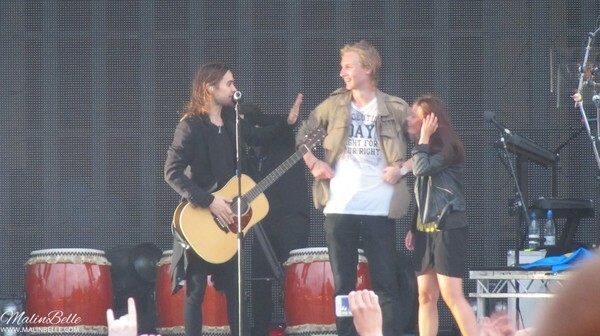 2 lucky people who got picked by Jared to come up on the stage! 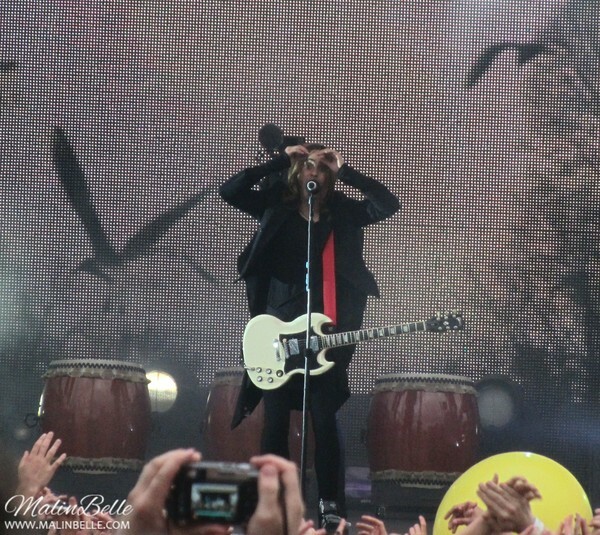 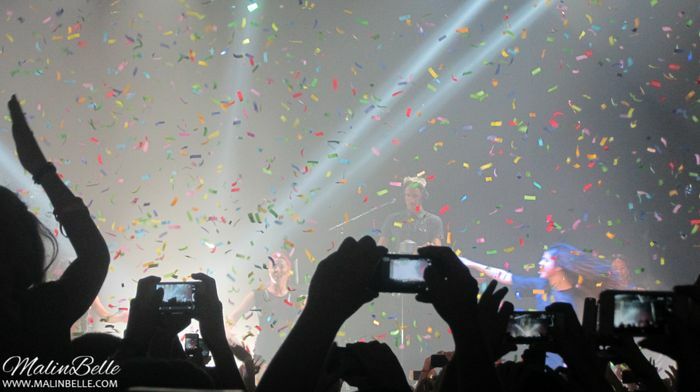 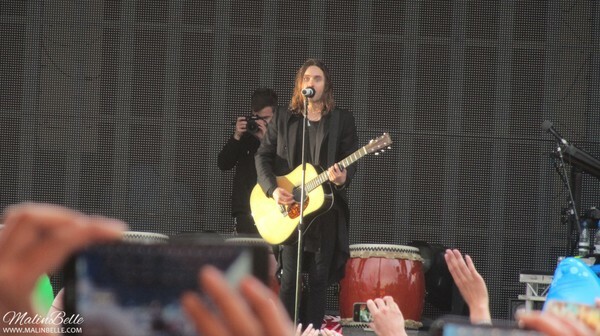 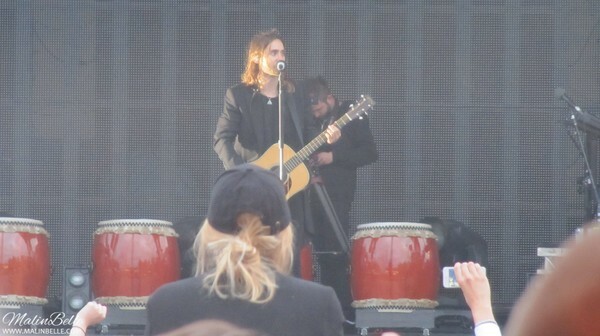 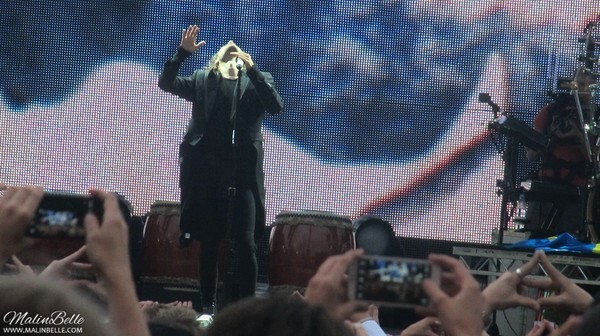 Jared taking an Instagram photo of us in the crowd. 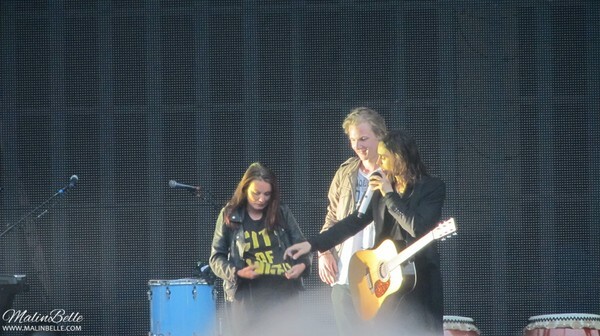 At the end of the concert, Jared picked some more people who got to come up on stage and somehow even more people got up on the stage, as you can see on the 2 photos. 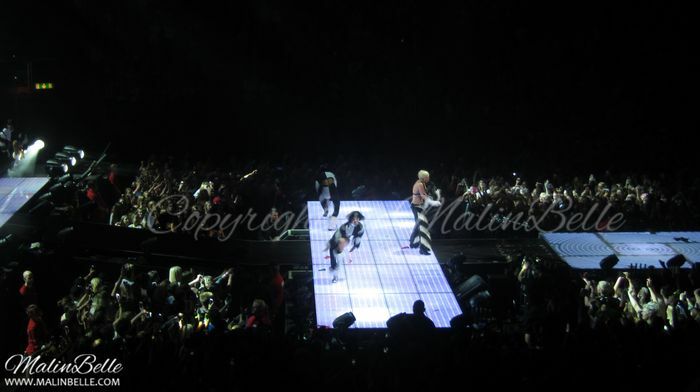 Birth | Closer to the Edge (Chant Intro; Ext. 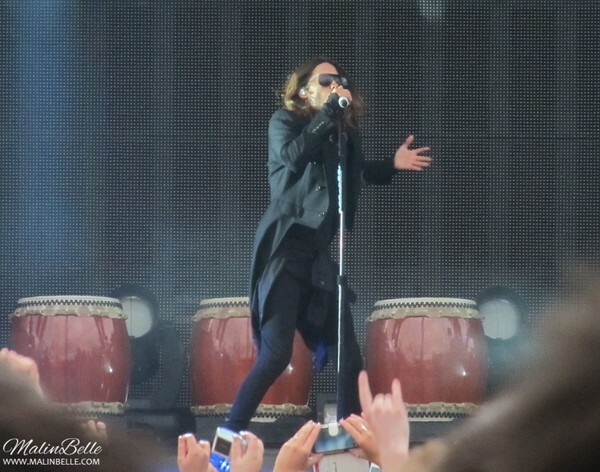 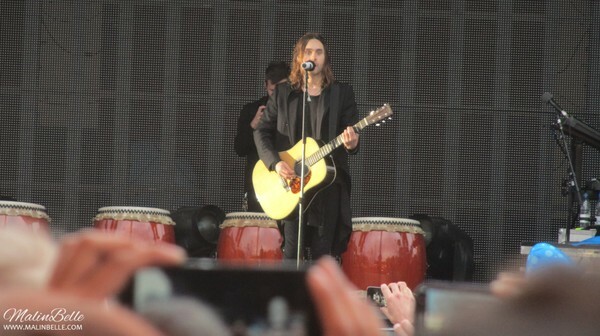 Outro) | Night of the Hunter | Search and Destroy | This Is War (Chant Intro) | End of All Days | Do or Die (Acapella Intro, Acapella Outro) | Conquistador | City of Angels. 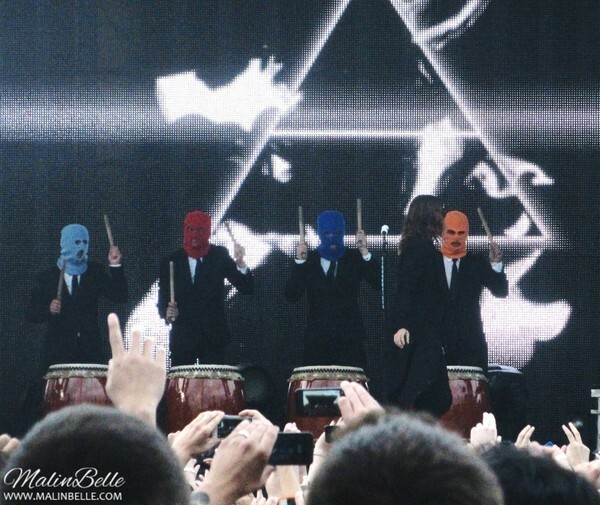 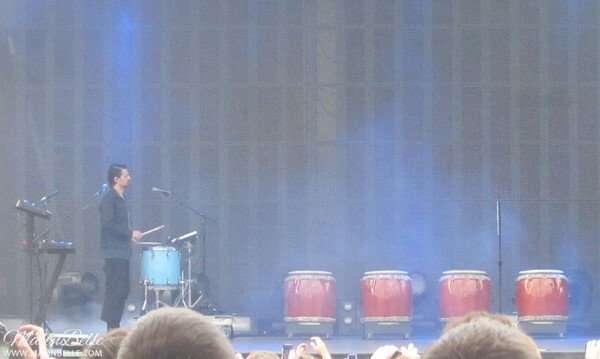 From Yesterday (Snippet) | Hurricane | Northern Lights (Snippet) | The Kill (Bury Me) (Special Version). 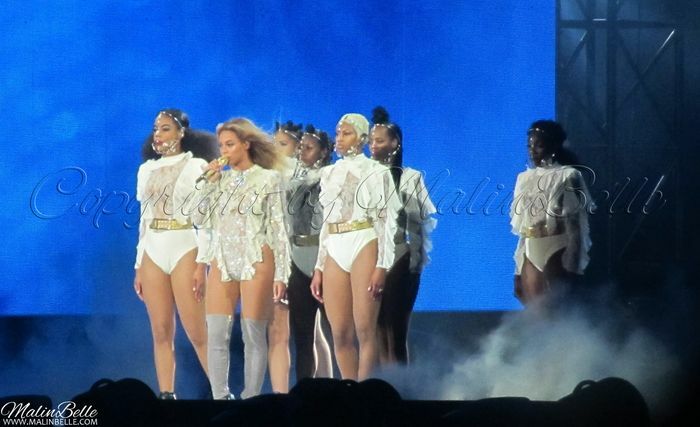 Kings and Queens (Ext. 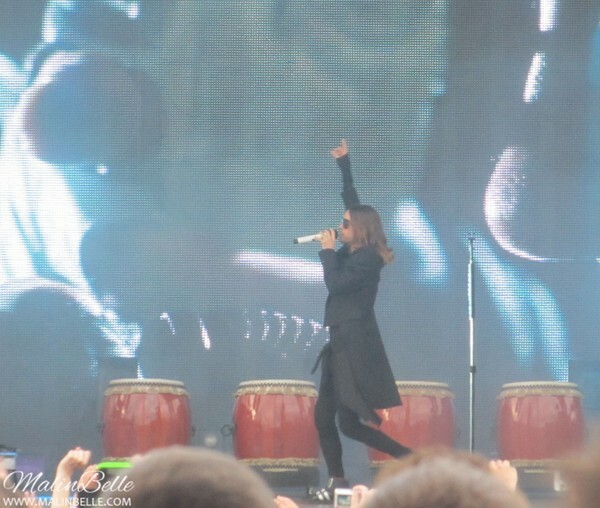 Outro) | Up in the Air. 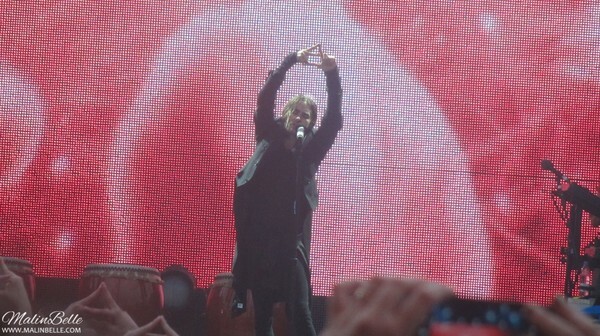 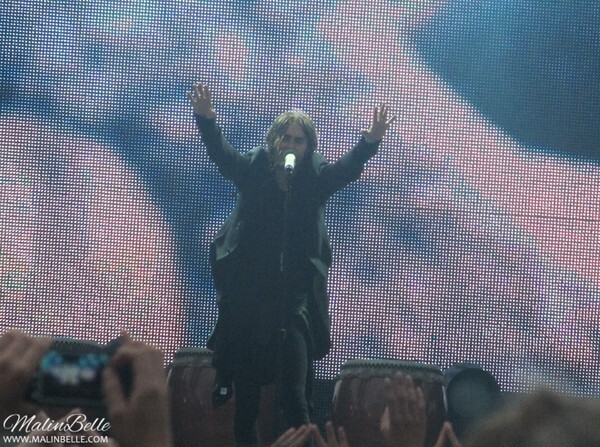 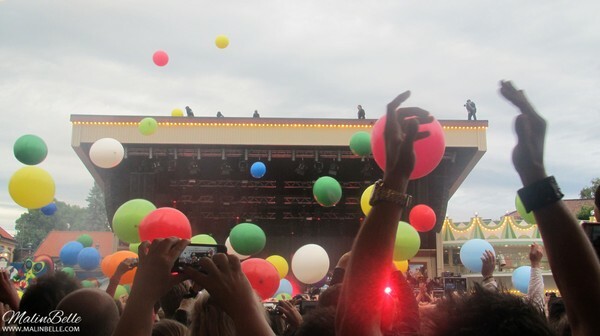 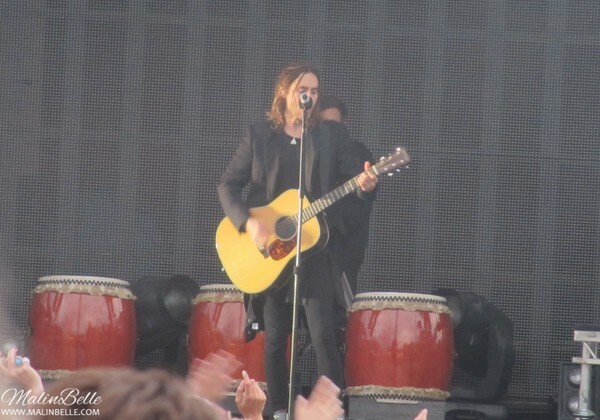 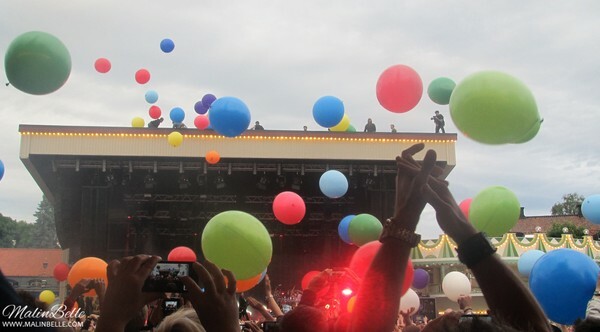 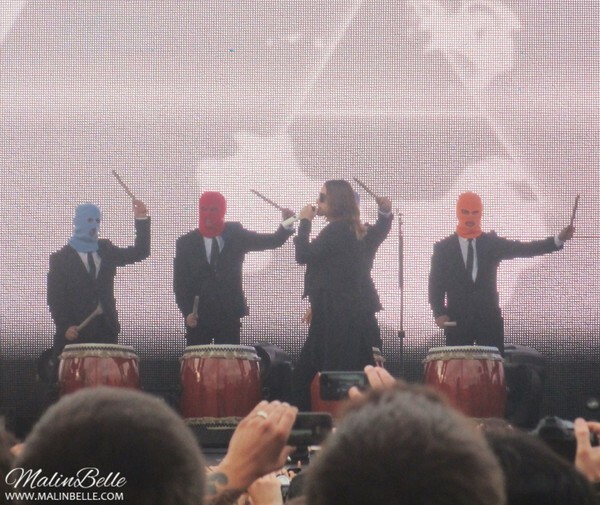 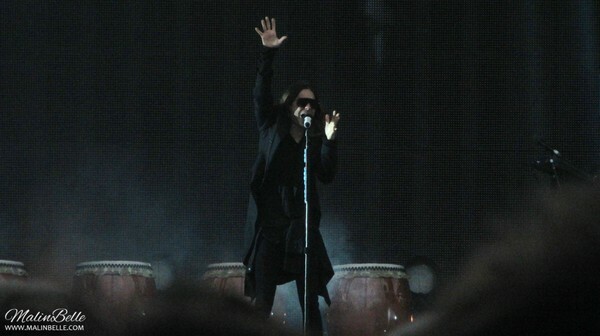 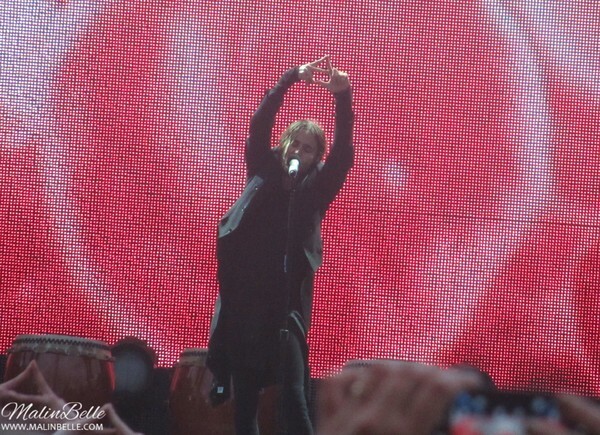 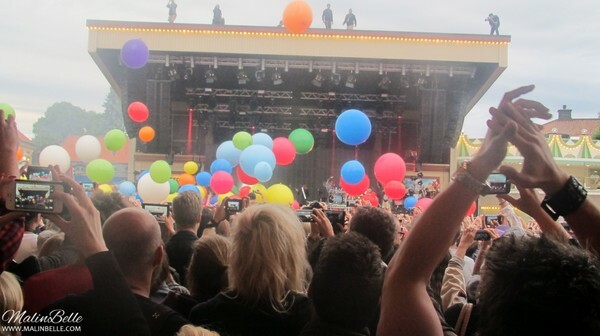 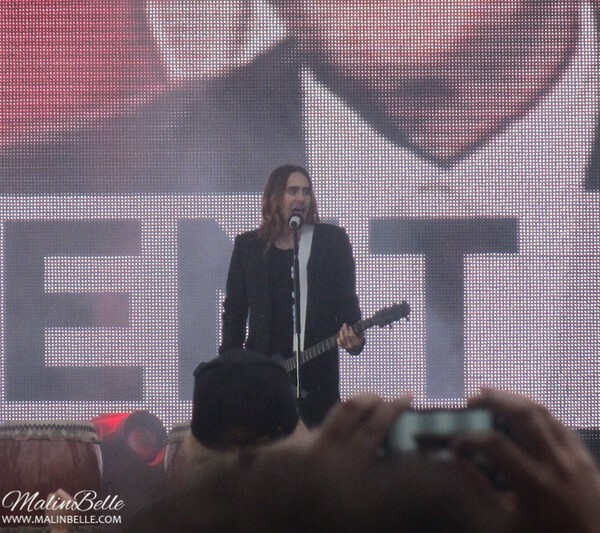 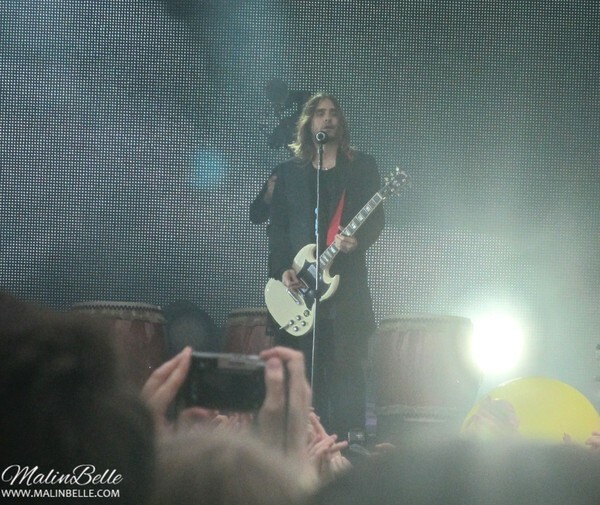 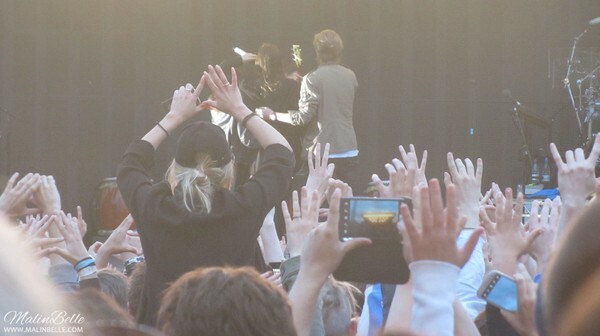 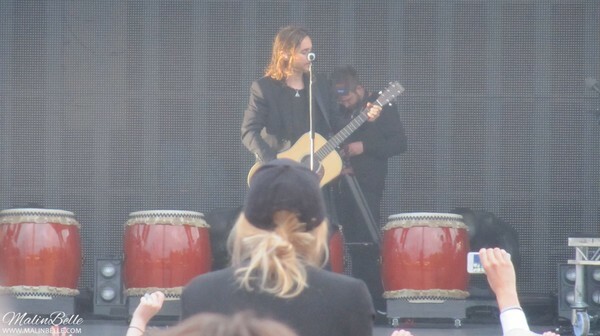 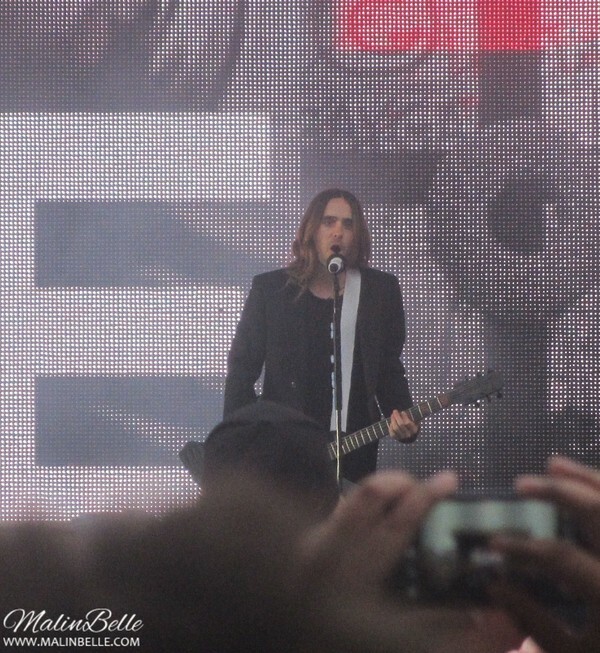 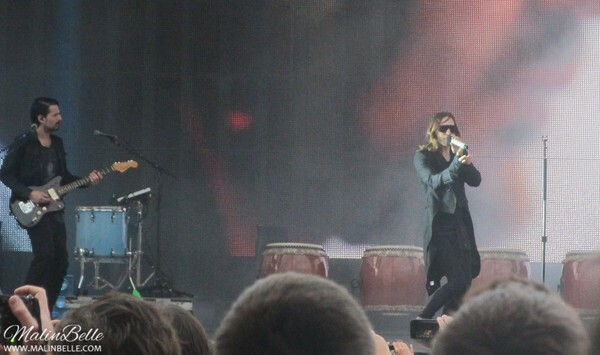 30 Seconds to Mars @ Gröna Lund. 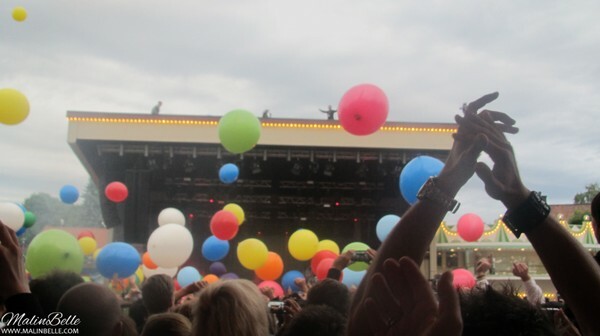 30 Seconds to Mars “Love Lust Faith + Dreams” concert at Gröna Lund in Stockholm, Sweden.